Rocket Robbie Daly in the Auto's led the team charge with a perfect card! Five races equalled five 1sts in a dominant display for the overall Auto win! Preston Williams won the 125's not dropping out of the top two the whole weekend scoring 1-2-2-1-2, with Rookie team mate Louie Kessell joining him on the podium with a stupendous 3rd overall, and 1st in the 125 Rookies! Reigning SW85 British Champion Bailey Johnston stepped up to the Big Wheels this year with customary intent scoring a consistent 3-3-3-3-3 for 3rd on the podium and 1st in the BW85 Rookies. Ben Mustoe was back competing in the SW85's after only two weeks off crutches from a broken leg. An excellent ride of 2-2-3-3-6 saw him take 3rd step on the podium, with vital points and time now to build his fitness before the next round. 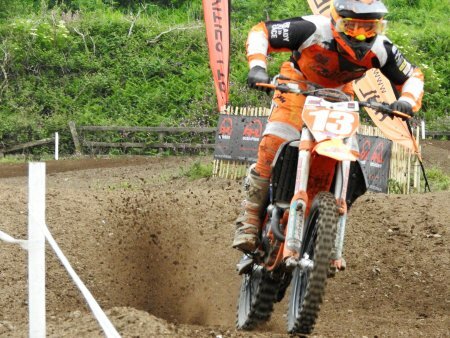 Off the back of his 125 British title Drew Anderson also moved up a category this season to the Opens. His focused determination by riding the last two races with a broken hand won't have gone unmissed by his fellow competitors, especially to score 4-2-3-3-3 for 3rd overall, and 2nd in the Open Rookies. SW85 Rookie McKenzie Marshall started & finished well with a 5-16-23-6-9 card for 9th overall and 4th in the SW85 Rookies. Whilst in his first year in the Auto's young Riley-Ray Barrow impressed, finding his feet on day two going 5-9-5 for 10th overall and 8th in the Auto Rookies. The 65 riders fought hard all weekend, with Zane Stephens securing 12th overall and Archie Britton a solid 15th in the 65 Rookies. Johnston Wins The Zimbabwe Summer Series 2018! Judd Orange Brigade rider Bailey Johnston won the Zimbabwe Summer Series today in the final days racing. 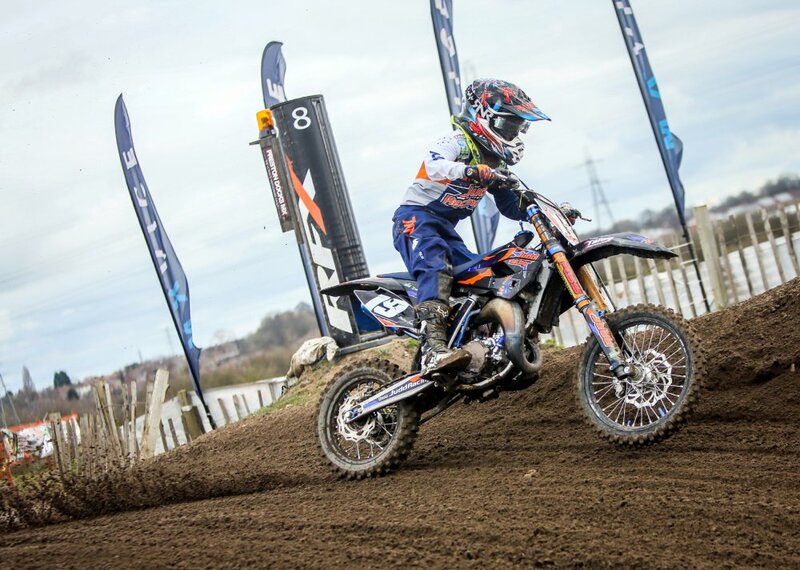 The KTM UK Youth Team Rider won the 85 category in style winning all three races for a perfect 1-1-1 card, and even won all three holeshots! In winning the Zimbabwe Champsionship Bailey received a cheque for 3,000 Rand, and in a touch of class donated the cheque to the boy who lent him his KTM 85 SX bike for the series, Ricky White! An act of a true Champion, and an awesome result! Well done Bailey, well done! The ‘Zimbabwe Summer Series 2018’ was held over 3 competitive days, with two days of Supercross on the 12th & 14th December and one day of Motocross on the 16th. The track location was Donnybrook Park. Judd Racing, KTM UK, Motorex, Dunlop, Acerbis, Rip n Roll, Samco Sport, Talon Engineering, Spiral GFX, WP Suspension, RSS, Technical Solution. Judd Orange Brigade Win - 4 - British Titles In 1st Year! 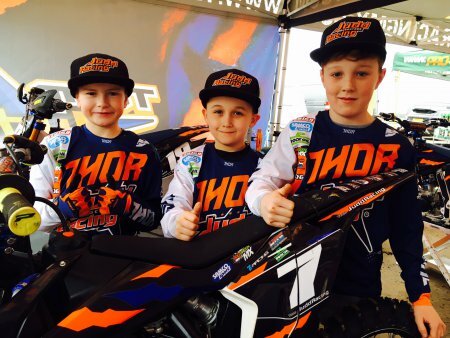 What a year it’s been for the Official KTM UK Motocross Youth Team! 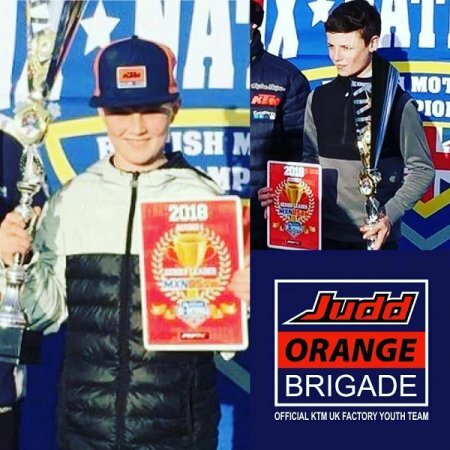 The Judd Orange Brigade stormed to 4 British Titles out of 6 they contended at the 2018 Judd KTM British Youth National Championships, to make it an inaugural year to remember! 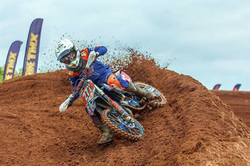 The conclusive round of the Championship came at Weston-super-Mare at the end of October, where a brisk yet sunny day, saw the British Youth Motocross elite converge on an excellently converted beach MX track. Fresh from being crowned the Weston Beach Race 85SW Champion 2018 the previous week, Bailey Johnston had the bit between his teeth for more title glory and he didn’t disappoint going 2-2-1-1 to win the Round, the British 85 Small Wheel Title and 85SW Rider of the Year! Jack Grayshon followed suit immediately after to also win the round with a 1-1-1-2 card and the 85BW British Title! The results kept coming in the 125’s with Drew Anderson again winning Round 6 to be crowned 125 British Youth Champion & 125 Rider Of The Year. Aaron-Lee Hanson finished off the quadruple winning the overall & British Open Title with a 2-1-2-1 card, and in doing so completed a clean sweep of overall’s for all 6 rounds. In the 65’s rookie Zane Stephens showed his potential for next years campaign with his best set of results of the season. A 6-7-6-6 power play saw Zane on the podium in 5th overall for the first time this year, finishing Championship 10th. Also in the 65’s Billy Askew won race 1 and followed it with a triple of 3rds for 2nd place overall and 4th in the Championship. Auto ace Archie Britton could only watch & cheer his team mates on from the side lines, nursing a broken ankle from round 5 at Sherwood. Archie had been in 2nd place in the run up to this round, setting the fastest lap in every round. Even without scoring any points at round 6 he still managed to finish 5th in the Championship. Judd Orange Brigade Shine In Sherwood! Drew Anderson punches the air for another win for the Judd Orange Brigade! 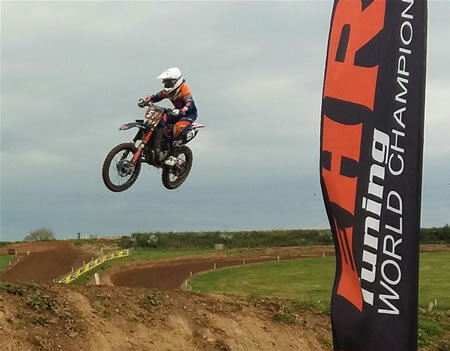 The Judd Orange Brigade – KTM UK’s Official MX Youth Team – put in a scintillating team performance in Nottinghamshire at the weekend at Round 5 of the JUDD KTM British Youth Nationals. Bailey Johnston produced a perfect professional performance going 1-1-1-1 to win Round 5, and extend his 85SW Championship lead to 40 points. Not to be outdone Aaron-Lee Hanson followed suit, with a clinical 1-1-1-1 card for the round win that extends his lead at the top of the Championship to 119 points in the Opens. In the big wheel 85’s the theme continued as an excellent ride from Jack Grayshon won him the round with a 1-2-1-1 card, and moved him up to 2nd in the Championship with a mere 9 points now separating him and the top spot. His final race was one to savour, as after his bike stalled on the start line, Jack then proceeded to move from last, through the whole field before winning the race with an 8 second race gap! A piston problem in the first 125 race left Drew Anderson having to push his bike over the line for crucial Championship points. Undeterred he rode superbly for the next three races going 12-2-1-1 for 2nd place overall! That now puts him just 13 points off the Championship lead in 2nd, with it all to play for at Weston. In the 65’s Billy Askew took a very well deserved 3rd step on the podium scoring 3-4-3-3 and moved up one notch to a tightly contested Championship 4th. In the same category Zane Stephens broke into the top ten with a 9th place finish in race 1, scoring 9-12-15-14 to finish 14th overall, but more importantly moving up three places to 11th in the 65’s Championship table! It was a weekend of highs and lows for little Archie Britton. The auto ace qualified 1st and set the fastest lap in all four races! An off in race 1 saw him finish that one 10th, but he came out the blocks for the next two races with a 2nd and a 1st. However another off in race 4 threw him over the handlebars for a bad fall that would later find he’d broken his right ankle in four places! Yet this plucky rider still got back on his bike and completed the race for 4th place overall. That injury inevitably puts Archie out of the final round, although he’s currently in Championship 2nd! Well done to all the team yet again and get well soon Archie! KTM UK to Expand Official Motocross Youth Team! 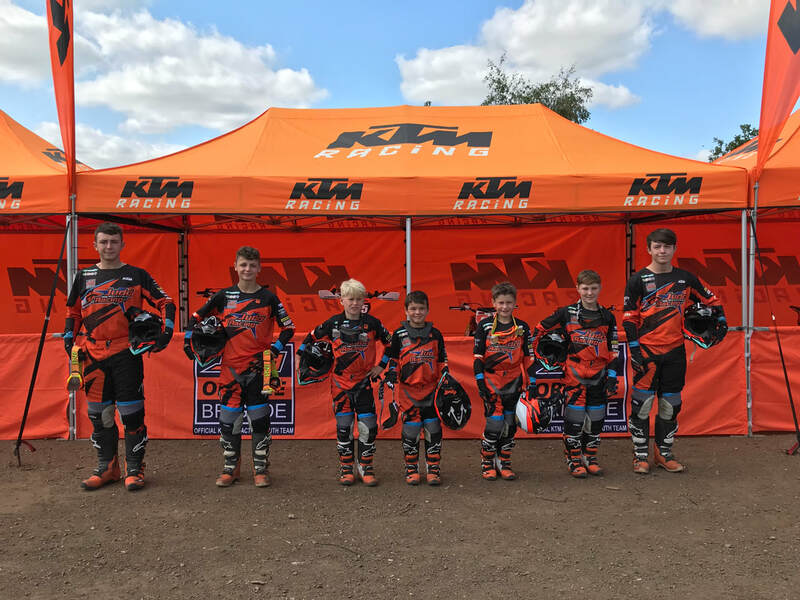 KTM UK’s Official Motocross Youth Team, the Judd Orange Brigade, is looking to increase its ranks with new team riders to compete in the 2019 Judd KTM British Youth National Championship. The current squad of seven is due to expand to twelve to cater for two riders in each class of the series; 50cc, 65cc, 85cc small wheel, 85cc big wheel, 125cc, and 250cc. The inaugural season of the team has been a highly successful one. With two rounds remaining in the 2018 series, three of the seven Judd Orange Brigade riders currently lead their championships – with five competing for the top three places. Team riders have also benefited from a KTM UK organised Bootcamp which saw riders get expert coaching, WP Suspension support, sports psychology sessions and media training. 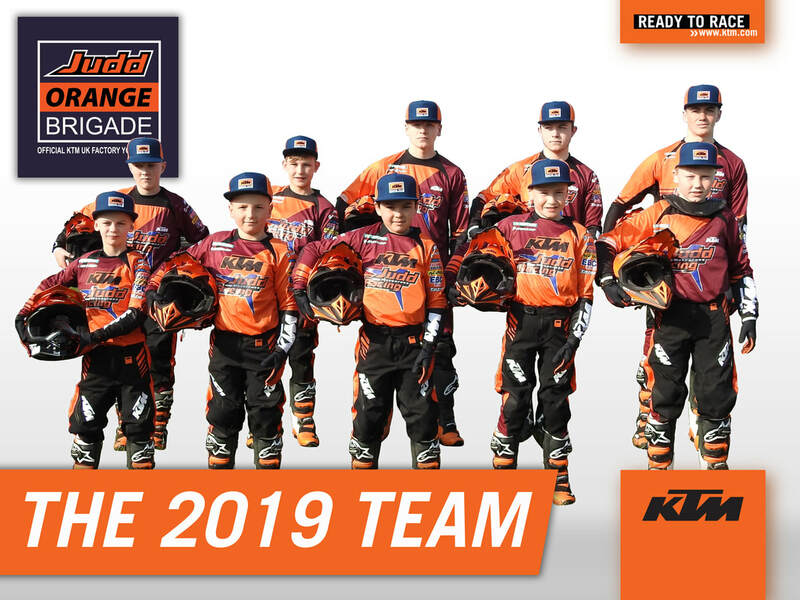 The 2019 Judd Orange Brigade squad members will run under the team’s extensive set-up at all BYN events and be provided with comprehensive support from KTM UK. The package includes two race machines supplied at a subsidised cost that are then complimented with a comprehensive KTM PowerParts package. Racers will be kitted out in full KTM PowerWear and a healthy spares budget is incorporated. WP Suspension Pro Component upgrades are also available at a subsidised cost. This means that when each rider comes to each race they are primed with the best machinery beneath them. On top of this, 2019 will see an enhanced KTM Bootcamp programme to develop each rider’s skills. Michelle Arnold, Judd Racing Managing Director, said: "We’ve had a fantastic season so far and really seen our riders develop and advance throughout the championship. Being supported by KTM UK we are able to offer our squad the machines, coaching and support they need to progress – and this is certainly something we’re looking to expand on in 2019. "Moving forwards, it has always been the intention to have two team riders in each youth class and I'm pleased to say we're now putting this in place with KTM UK for the 2019 season. The reason to enlarge the team is to successfully manage the progression and continuity of each rider’s achievements. When stepping up in an age group, we need to aid the development of each rider’s skills whilst still challenging in every youth class. Commenting on the developments, Matt Walker, KTM UK Managing Director: "The Judd Orange Brigade has seen a huge amount of success in a short space of time across a wide spectrum of the KTM SX range. KTM UK is committed to its READY TO RACE ethos and we’re taking the necessary steps to support and develop our junior team as they progress forward. Judd Orange Brigade Dun Good! 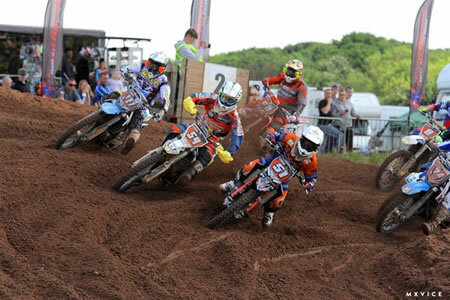 The Judd Orange Brigade headed up to Scotland to the Duns Motocross Track, for Round 4 of the JUDD KTM British Youth Nationals. Aaron-Lee Hanson had a perfect clean sweep in the Opens with four first place finishes, taking maximum points and stretching his championship lead to 90 points. Bailey Johnston continued his 85 Small Wheel campaign with a 2-1-1-5 to give him second overall and remain the championship leader. Moving up to joint first in the 125 Championship was Drew Anderson. An action-packed category saw Drew outscore his nearest rival with a 5-4-5-2, for third overall. In the Big Wheel 85’s Jack Grayshon fared third with a 4-1-1-5 set of results maintaining third in the championship. Auto rider Archie Britton scored a 7-11-2-2 for second overall and second in the championship. Billy Askew started strong in the 65’s with a 1-4 but disaster struck for the final two races resulting in 23-22 taking 11th overall and fifth in the championship. Also in the 65’s Zane Stephens continued his first-year progression in the category moving up to 14th in the championship after scoring of 16-17-13-14 for 17th in the round. 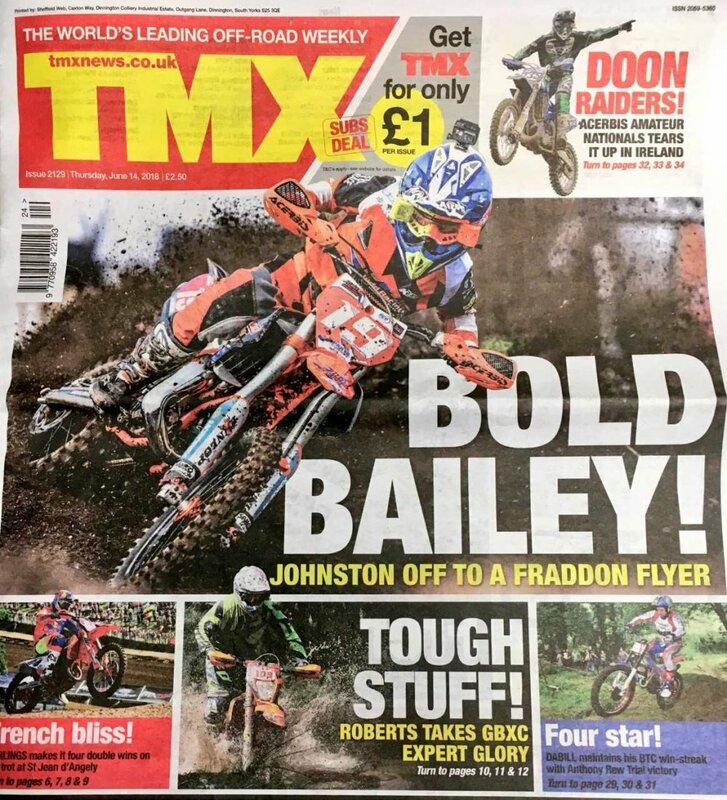 Bailey Johnston Headlines Front Cover of TMX! Sun Shines On The Judd Orange Brigade! 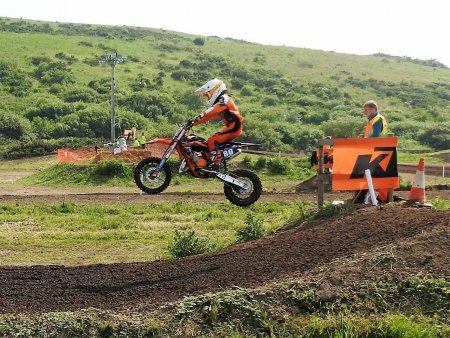 It was an awesome weekend of weather & results as the sun shone on the Judd Orange Brigade at the JUDD KTM British Youth Nationals, Round 3 at Fraddon Motopark, Newquay. 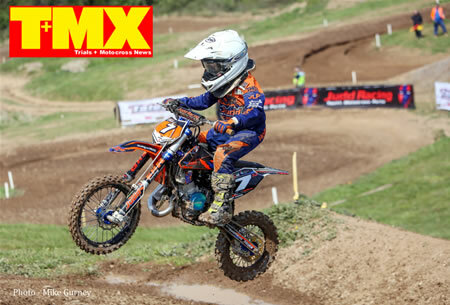 The Official KTM UK Factory MX Youth Team had 6 out of 7 riders on the virtual podium at the end of the weekend with a haul of 2 x 1ST’s, 2 x 2NDS, 2 x 3RD’s & 1 x 14TH! The 14th finish from 65 rookie Zane Stephens show’s how he’s really starting to feel his way now in his first year in the 65’s since moving up from being the ACU Auto Champion last year. His results over the weekend were a very credible 18-12-10-11 with an unbelievable start on race 4 where he led the race for the first lap! This has now moved Zane up 3 places in the Championship to 15th! Aaron-Lee Hanson in the Opens continued his winning form going 1-3-1-1 to win the round and retain 1st in the Championship with a 25 point lead. Bailey Johnston in the small wheel 85’s opened and closed the weekend with wins in races 1 & 4 with a 2nd & 4th finish in between. This gave him the overall win, but it was in race 4 where an enthralling finish saw Bailey dash for the finish line from 2nd place to win the race by a mere 0.217 seconds. Exciting stuff and he continues to lead in the Championship! Billy Askew was on top form to retain his 2nd place in the Championship. A consistent 2-3-2-4 performance gave him a well earned 2nd place finish in round 3! After a clean sweep in the last round Archie Britton was determined to continue the winning streak in the Auto’s and he didn’t disappoint with a 1st & 2nd on day 1. A couple of unfortunate off’s from pushing hard on day 2 saw Archie have to battle back to 6th & 5th in races 3 & 4 but his dogged determination paid off landing him 2nd overall! It was similarly a weekend of two different days of fortune for Jack Grayshon in the 85 big wheels. Off’s in the first two race’s gave him a 9-5 card as he got attuned to the track, and boy was he tuned in for day 2 though as he nailed race’s 3 & 4 with two 1st place finishes for a 3rd overall and a move up the Championship table to 3rd! Drew Anderson initially made hard work for himself in the 125’s to come through the pack to 4th & 5th in the two openers, but he stepped it up for two excellent races (and viewing) after this with some great battles for a 2nd & 3rd , for a 3rd place overall! Drew sit’s in 2nd place in the Championship just 11 points off the lead. Well done yet again Team! 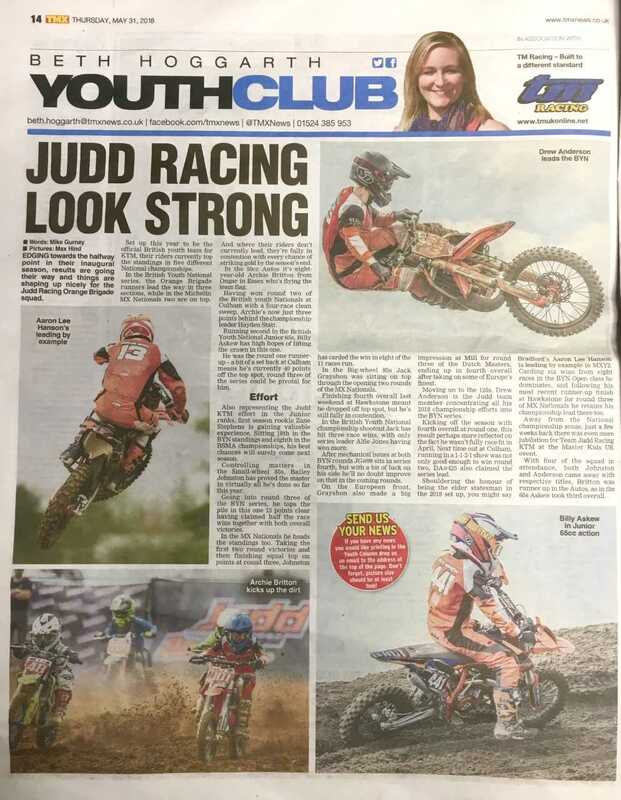 TMX News Feature the Judd Orange Brigade! 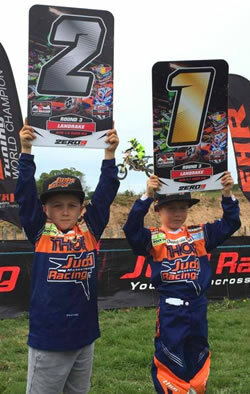 Podium Finishes for Judd Orange Brigade at BYN's! 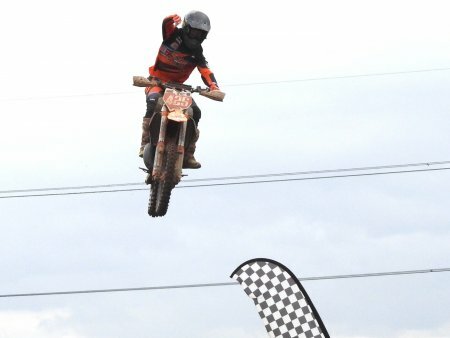 Aaron-Lee Hanson lifts the Winners Trophy in the Open Class at Round 1 of the JUDD KTM British Youth Nationals! 85sw Rider Bailey Johnston claims 1st place overall! Billy Askew takes 2nd in the 65's! 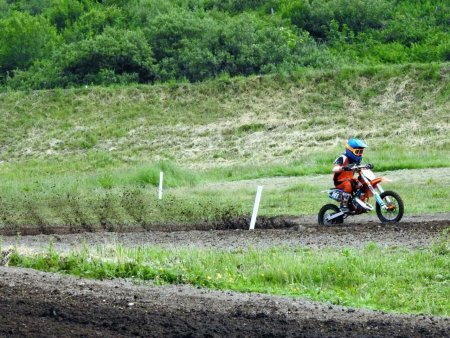 Archie Britton flies home to win two out of four moto's in the Auto's! What a great official start for the Judd Orange Brigade at Round 1 of the JUDD KTM British Youth National Championships this weekend! Preston Docks MX was the venue that saw the action unfold on a track that although boggy at first sight, turned out perfect in the end. 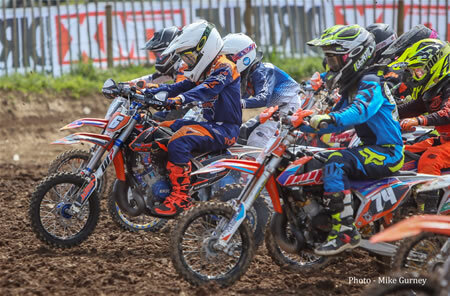 Here’s how the seven riders of the Official KTM UK Factory MX Youth Team got on. 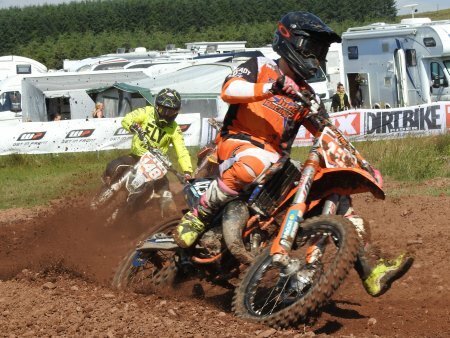 Aaron-Lee Hanson shone on his 250 SXF with 3 wins out of 4 to take 1st in the Open class! The 17 year old from Bradford was trying to make it a clean sweep but a puncture on Race 3 dashed those hopes, resulting in him re-joining the race a lap down. Bailey Johnston just got better & better to win the small wheel 85's with a perfect day two scoring 3-2-1-1 and picking up the Hole Shot Prize to boot. 10 year old Billy Askew never dropped out of the top 3 all weekend in the 65's. A 2nd and a 1st on day one set him up nicely tied at the top of the leader board. He followed this with a 2nd and a 3rd on day two to come home 2nd Overall. In the Auto's Archie Britton picked up a 4th Overall. He got off to a flyer winning his opening race, before a brief off in Race 2 saw him finish 5th. Undeterred the youngest rider in the team opened day two with another 1st, but it was in Race 4 that misfortune struck as a spark plug issue meant he ended the race 21st. Drew Anderson had a mixed weekend of results. On day one Drew fought from the back twice to a 9th and a 15th, but day two was a different story with Drew challenging for the front with a 2nd on Race 3, and a 5th in Race 4, resulting in a 4th Overall. All looked good for Jack Grayshon in the 85 big wheels when he qualified 2nd and just 0.03 seconds off the fastest time. Race one though resulted in a DNF after a throttle cable malfunction, but this didn't deter the young man from Castleford, who came out all guns blazing to finish 2nd in the following moto. An off on lap one of Race three saw Jack fight his way through the pack to finish 6th, before finishing the meet with a win in Race 4 and picking up the Hole Shot prize. After a January in the limelight of Arenacross, rookie 65 rider Zane Stephens took to the track with an accomplished 12th in the first race of the day and a 22nd on the second. Consistency shone through with a brace of 15th positions for Zane on day two to put him into 15th overall and some valuable lessons learnt as he continues his progression. Drew Anderson turns up the heat in race 3 to finish 2nd, and 4th overall in the 125's! Zane Stephens shows his style in the 65's as he secures 15th overall in his rookie year! 85BW Jack Grayshon winning the Holeshot prize and taking 1st in race 4! Judd Orange Brigade Riders Start With Wins! 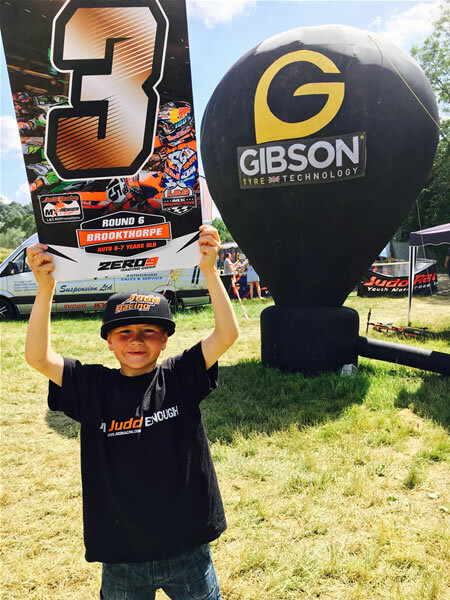 What a starting weekend it's been for the Judd Orange Brigade, who put in some superb performances & top podium finishes, namely three overall 1st's and a 2nd at the opening rounds of the MX Nationals and EASSC! The quagmire that was Preston Docks for the MX Nationals opener, was a mud soaked track that put both the riders & their bikes through their paces. However the Judd Orange Brigade riders relished the challenge and excelled in the troublesome conditions. 85 Small Wheel rider Bailey Johnston was 1st overall with an almost perfect 1-1-2 card, while 85 Big Wheel rider Jack Grayshon also took 1st overall with an exceptionally competitive 2-1-1 card. 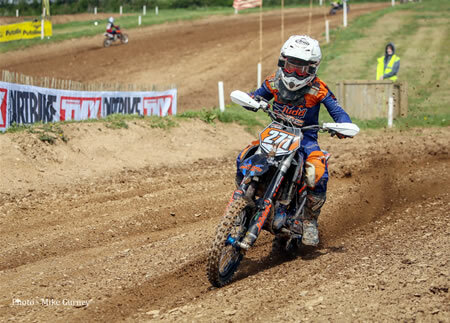 In the MXY2 250 SXF team rider Aaron-Lee Hanson battled to an excellent 2nd overall, after a small crash in race one saw him finish 4th, but followed that with a brace of 2nd places in the following moto's. The weather didn't fare much better further south in Suffolk, where the EASSC started their summer series at the Mildenhall Stadium. Drew Anderson was in attendance to put his KTM 125 SX through it's paces and to fight for top spot. He did just that with another 1-1-2 set of results that also saw him 1st overall for weekend. 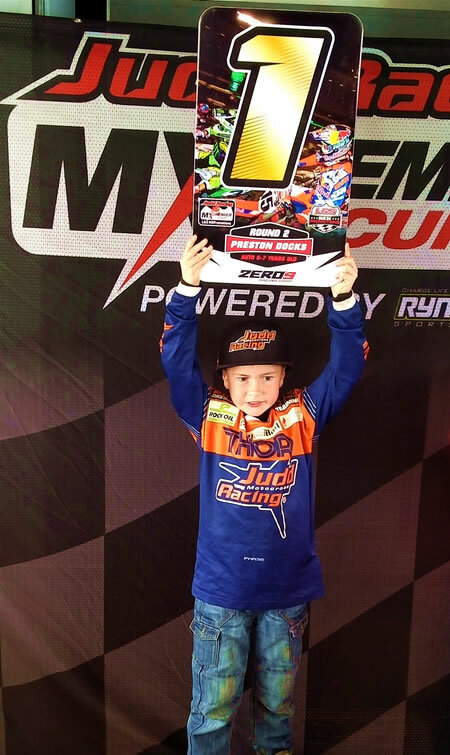 The team's youngest rider Archie Britton was flying on his KTM SX50 in the EASSC Auto category winning Race 1 and clocking the fastest lap. However, an eagerness to push hard meant two off's in the next two races and regardless of setting another fastest lap, meant he closed the weekend off the podium this time. 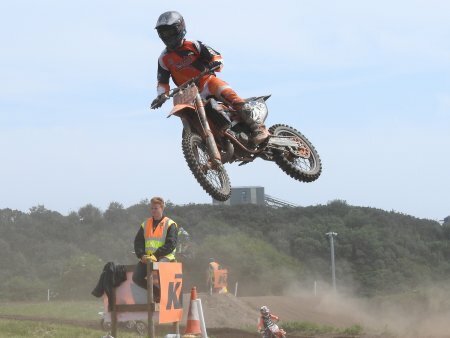 All in all an excellent opening weekend performance, and a great warm up for the JUDD KTM British Youth National Championships on Saturday, which also coincidentally kicks off with the opening round at Preston Docks. Zane Stephens & Billy Askew will be back to compete in the 65's and to complete the full team compliment for the official launch. Here's hoping the weather is better, but then again with these results maybe not! Congratulations to all the riders, and thank you to all of the fantastic Judd Orange Brigade team sponsors: KTM UK, Judd Racing, Motorex, Dunlop, Talon Engineering, WP Suspension, RSS, Technical Solution, Acerbis, Rip n Roll, Samco Sport, and Spiral GFX. Judd Orange Brigade Announce New Sponsors, New Logo & Launch Date! With the season's new team of seven riders recently finalised, the Judd Orange Brigade have now released the list of official team sponsors, on board to back the Official KTM UK Factory MX Youth Team. The teams launch will take place at the The British Motocross Championship Festival next weekend. 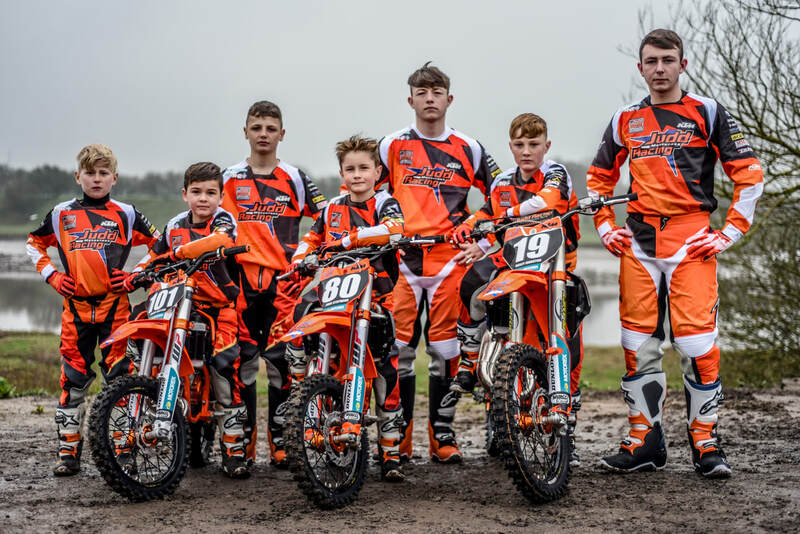 The full Judd Orange Brigade team line up of: Archie Britton (Auto's); Zane Stephens (65's); Billy Askew (65's); Bailey Johnston (85SW); Jack Grayshon (85BW); Drew Anderson (125's); and Aaron-Lee Hanson (250), will be present and competing in the JUDD KTM British Youth National Championship which kicks of at Culham MX Park on Friday 30th March. 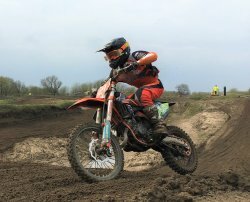 Askew Signs For KTM UK Youth Team! Judd Orange Brigade rider Billy Askew picks up his brace of brand new 2018 KTM 65 SX Team bikes! 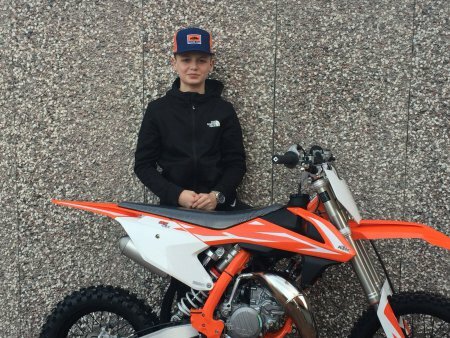 Following a cavalcade of talented riders, 65 pilot Billy Askew has continued the trend by signing for the Official KTM UK Factory MX Youth Team - The JUDD ORANGE BRIGADE! Billy will be using his two brand new KTM 65 SX's in competition with the rest of his new team mates at the JUDD KTM British Youth Nationals Championship at the end of this month. Well done Billy and good luck for the season. Hanson Signs For Judd Orange Brigade! Team rider Aaron-Lee Hanson happily collects his Judd Orange Brigade KTM 250 SXF bikes! Now for the team graphics & power parts! 17 Year old Aaron-Lee Hanson is the newest addition to the ranks of the Judd Orange Brigade. 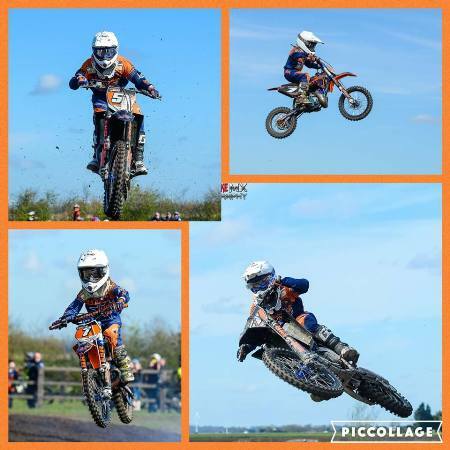 The newly signed team rider who hails from Bradford, will be the Official KTM UK Factory MX Youth Team 250 rider. 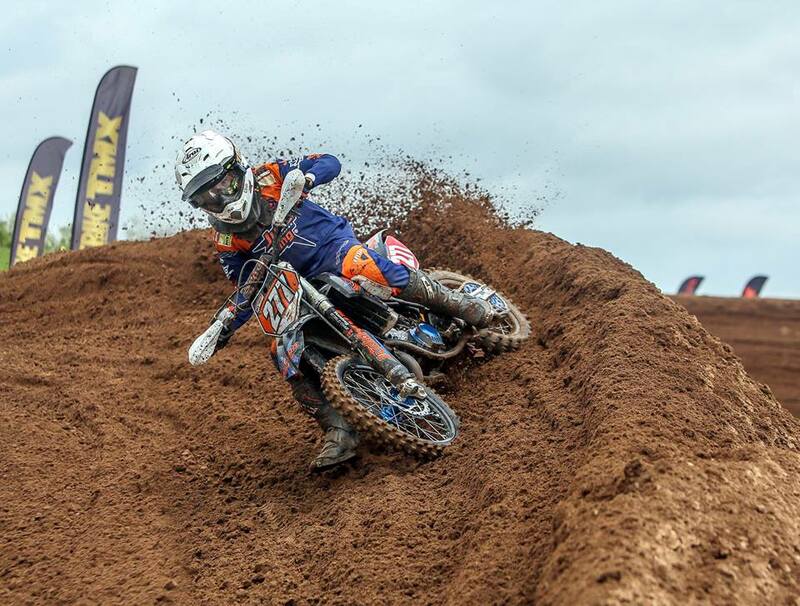 Having finished on the podium last year in the MX Nationals MXY2 in 3rd place, and a 4th in the MXY2 British Youth Nationals, he'll be looking to progress this season, especially now backed by all things orange. He said "Being in the Judd Orange Brigade team is a great opportunity for me to succeed within my career and help massively with publicity and recognition. It is also great to be a part of an Official Factory Racing Team and to be supported by KTM UK". 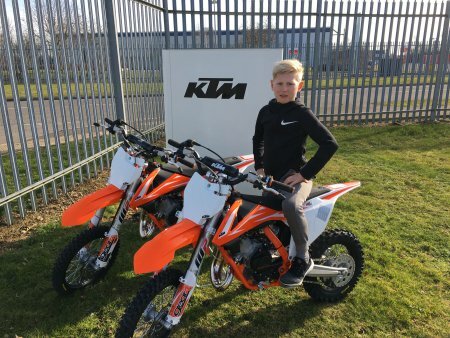 Aaron will be putting his two newly collected KTM 250 SXF race bikes to competitive use in this years JUDD KTM British Youth National Championships, along with the rest of his team mates at Culham on 30th March. Welcome on board Aaron and good luck this year. 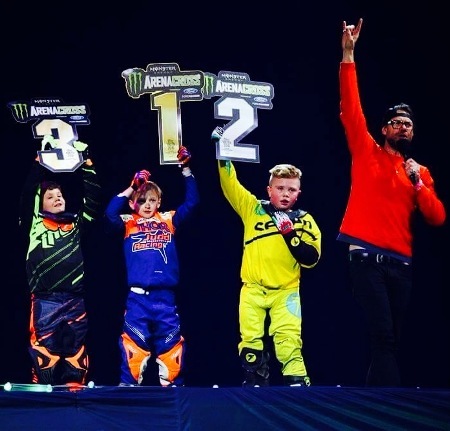 Zane Secures 3rd At Arenacross 2018! 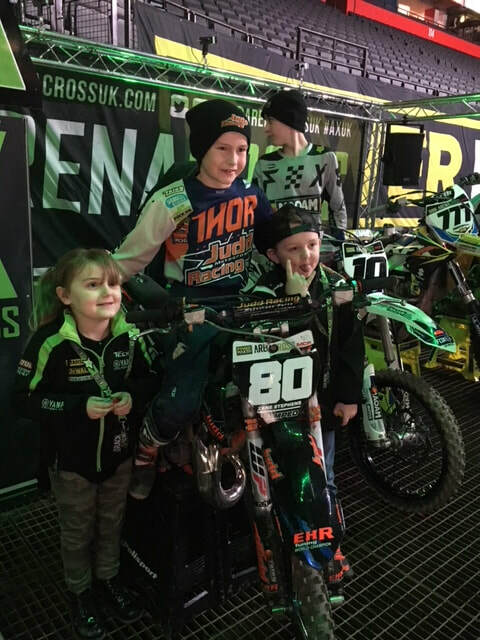 Judd Orange Brigade 65 rider Zane Stephens on the championship podium at Arenacross 2018! Zane Stephens flies for the finish at Arenacross 2018! Eating up the track at the Wembley SSE Arena! 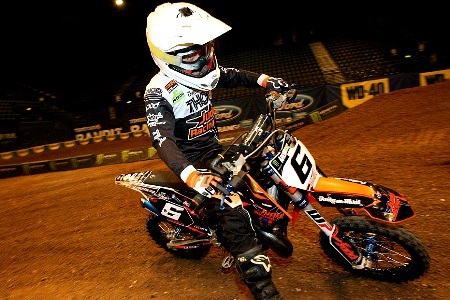 What a first championship it's been for Judd Orange Brigade rider Zane Stephens. 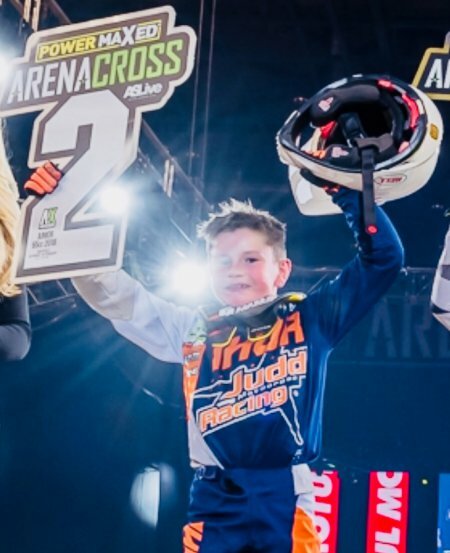 In his first National Championship on a 65 - after only just moving up from the auto's - the youngest rider in the whole event has romped home with a place on the Championship podium and 3rd place at Arenacross 2018! The last round at the SSE Arena, Wembley on Saturday wasn't plain sailing though, with Zane taking an off in Race 1 to finish 8th in the afternoon, before getting back on form in the evenings Race 2 pulling in 3rd! That was enough to secure Championship 3rd place in a hard fought, competitive and it has to be said very exciting 65 category! Well done to all of the riders this year, and congratulations to a very happy #80 Zane Stephens on a great performance. 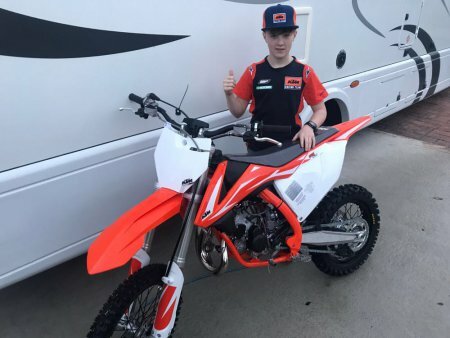 This will set him up nicely now for the start of the JUDD KTM British Youth National Champsionship which commences at the end of next month, and where Zane and the rest of his Judd Orange Brigade team mates will be competing. Stephens Moves Up To 2nd in Championship! 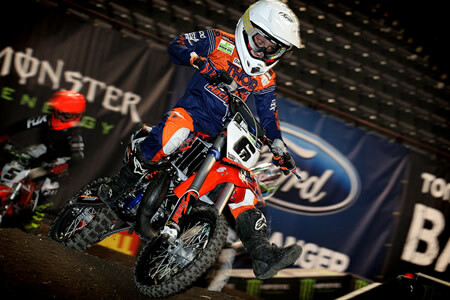 Judd Orange Brigade rider Zane Stephens moves to 2nd and within sights of 65 title showdown at Wembley! 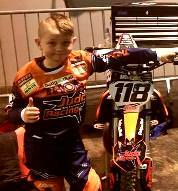 Judd Orange Brigade 65 rider Zane Stephens moved up to Championship 2nd place yesterday at Arenacross Sheffield. The penultimate round saw the youngest rider in the competition take 2nd in Race 1, to repeat the same finish with a 2nd in the evenings race 2! 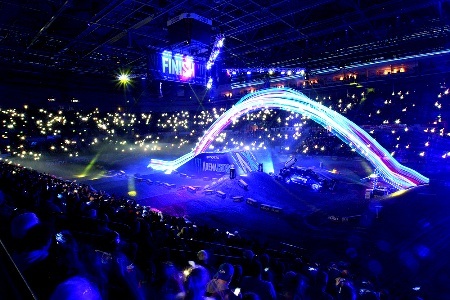 This now leaves the top of the 65’s poised for a scintillating climax at the finale next week at Wembley Arena, in what has been one of the most exciting Arenacross categories this year! Well done again Zane, and good luck in London! 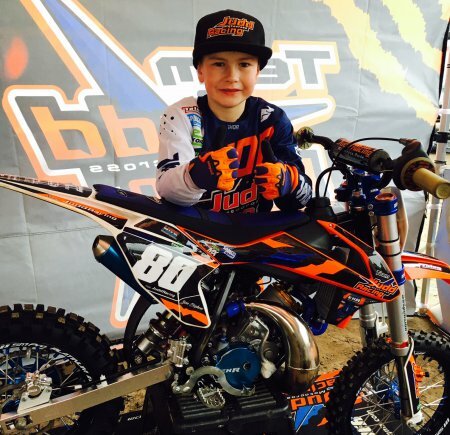 Britton Joins KTM UK Youth Team! Youngest addition to the Judd Orange Brigade - Archie Britton - shows off his brand new KTM 50 SX! 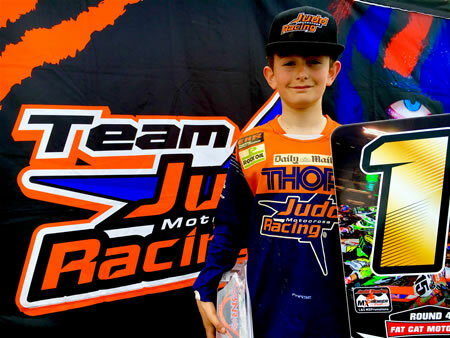 Archie Britton is the latest of a string of talented riders to join the JUDD ORANGE BRIGADE, KTM UK's Official Factory MX Youth Team. 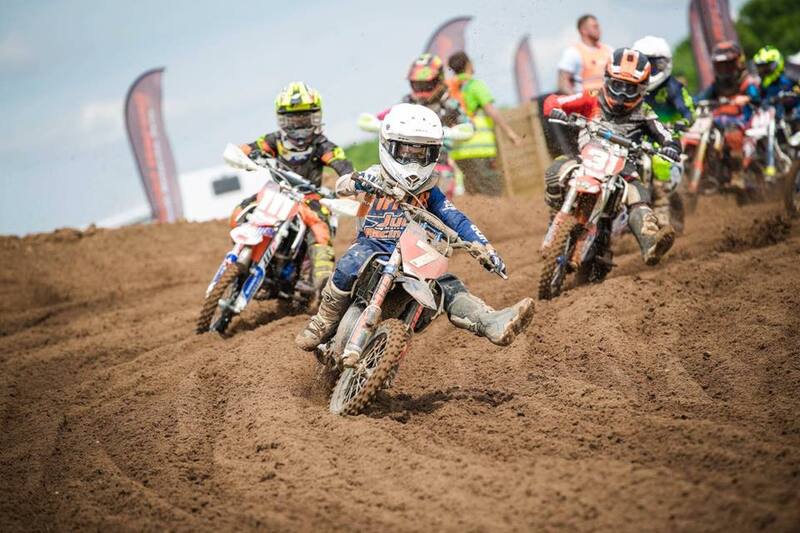 The 7 year old Auto rider from Essex, may be the youngest in the Orange team paddock, but this little fella packs a punch, which was shown last year in his first season at a national championship. Competing in the 6-7 Auto's, Archie took the Championship 'Runners Up' title of the Judd British Cup 2017, pushing his fellow competitors all the way to achieve 2nd step on the end of season podium. 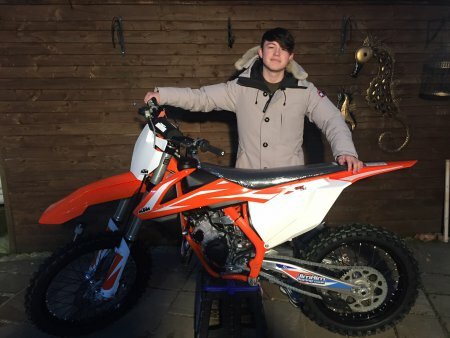 Described as 'over the moon' to be officially announced into the Factory Team, he was also very happy collecting his new ride for 2018, a gleaming new KTM 50 SX. 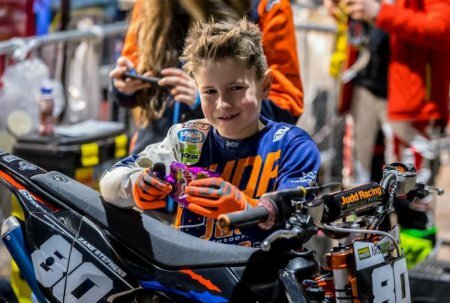 Archie will be putting his new bike to competitive use at the Judd KTM British Youth National Championships this year with the rest of his Judd Orange Brigade team mates. Welcome on board Archie, and good luck for the season. After winning the Judd British Cup, picking up Rider Of The Year, and taking 3rd step on the podium in the BYN's last season, Bailey Johnston has now been officially announced as a JUDD ORANGE BRIGADE rider! 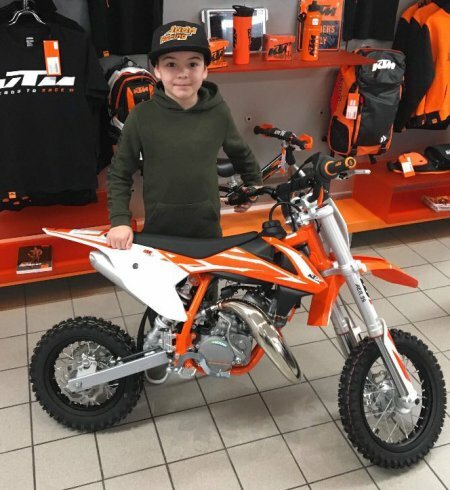 Joining the Official KTM UK Factory MX Youth Team is a dream for the young man from Leeds, who can be seen here collecting his Ready 2 Race 85 SX. 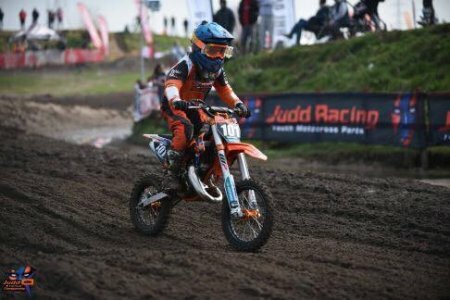 Bailey will be competing with the rest of his Judd Orange Brigade team mates at the JUDD KTM British Youth National Championships this year, in the Small Wheel 85's. Congratulations Bailey and good luck! Stephens Wins Twice in Belfast! 65 Judd Orange Brigade pilot Zane Stephens puts the pressure on Championship 1st & 2nd! 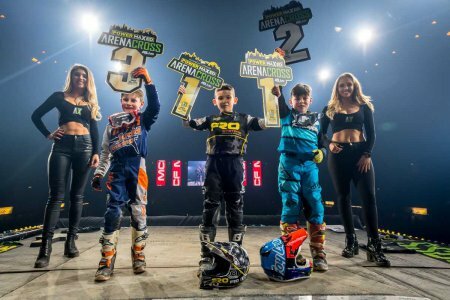 Arenacross UK Round 4 & 5 took place, back to back, over the weekend of 26th & 27th January 2018 at the SSE Belfast, and it was the youngest rider in the Champsionship who took two evening race wins! Round 4 saw Judd Orange Brigade's Zane Stephens, come runner up in race 1, before winning race 2 in the evening. He followed this up the following day at Round 5 with a 7th in race 1 after an off, and showed pure determination to win race 2 again in the evening, in front of a packed arena! This puts Zane firmly in 3rd place in the 65's Arenacross Championship, with just 1 point each separating the top three! With only two rounds left it's all to play for at Sheffield & Wembley! Zane Stephens leads from the front at Belfast Round 5! Judd Orange Brigade Welcomes Jack Grayshon! Judd Orange Brigade 85BW Rider Jack Grayshon collects his brand new 2018 KTM 85 SX! 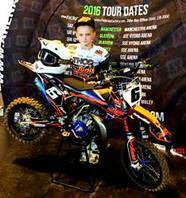 The Official KTM UK Factory Youth MX Team are pleased to announce it's new 85 Big Wheel rider - Jack Grayshon - to the team! 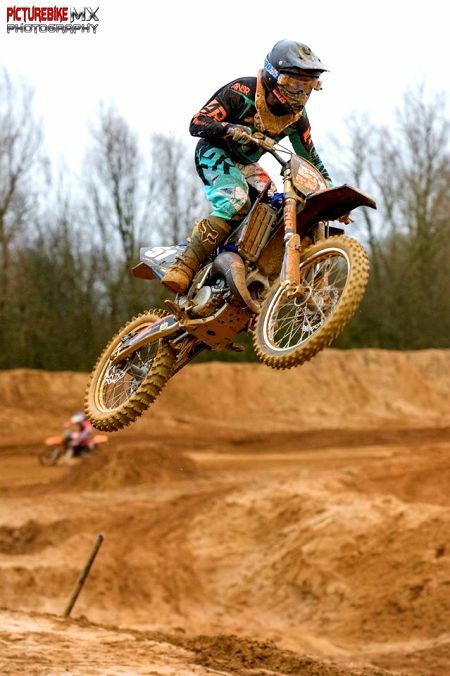 The 13 year old from Castleford, West Yorkshire has been competing in motocross for 7 years, in which time he's won the French Master Kids, won the Judd British Cup and taken 2nd step on the podium in the Dutch Youth Internationals, amongst others! You can see Jack competing with the rest of the KTM UK Youth Team at the JUDD KTM British Youth National Championships this year. Welcome to the Judd Orange Brigade Jack, and good luck for the season ahead. Judd Orange Brigade Welcomes Drew Anderson! Latest addition to the Judd Orange Brigade - Drew Anderon - with his New KTM 125 SX! 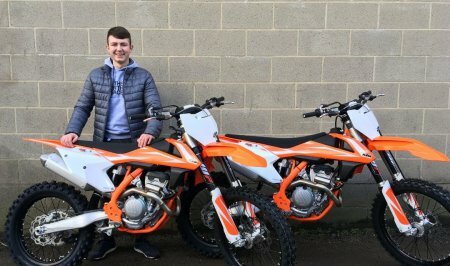 After being chosen to represent his country last season at the FIM World Championships, and placing Runner Up in the British Youth Nationals 125's, it's not surprising that Drew Anderson caught the eye of the Judd Orange Brigade, to be offered a place on the Official KTM UK Factory Youth MX Team. The very pleased 16 year old rider from Southminster can be seen here picking up his brand new 2018 KTM 125 SX, and when asked what was the best part of being a Judd Orange Brigade rider said 'Being part of a great team and getting the chance to ride for KTM'. Drew will be competing with the rest of the KTM UK Youth Team at the JUDD KTM British Youth National Championships this year. Welcome to the Judd Orange Brigade Drew, and good luck for the season. Zane looks ahead to a brighter Arenacross Round 3! Zane Stephens (above) still smiling as he looks ahead to Birmingham this weekend! After a flying Arenacross start in Round 1, Round 2 was a different kettle of fish for Zane Stephens as he toughed it out under the lights at the Metro Radio Arena last Saturday. A bike stall in the afternoons race one followed by a crash in the evenings race two, saw the Judd Orange Brigade 65 rider finish the day with two 6th places, and coming away from Newcastle with a Championship position of 4th. The ever positive Stephens still had a smile on his face, and with everything still to ride for, said that although this wasn't his best event finishing, he loved the show and had a good time with his mates. 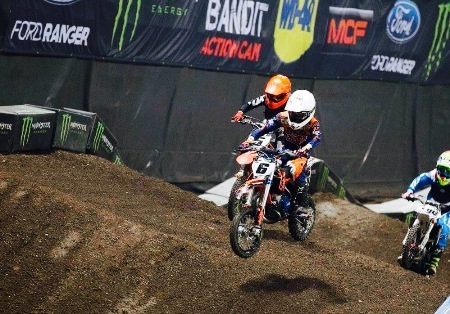 Stephens takes 1st Race Win for Judd Orange Brigade at Arenacross! 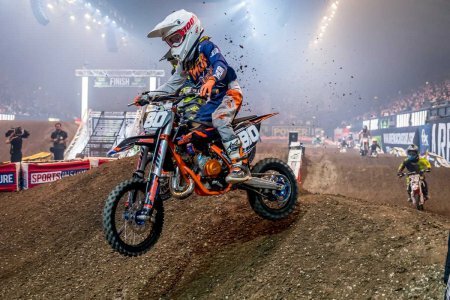 Judd Orange Brigades 65 rider Zane Stephens heads into this weekends Round 2 of UK Arenacross at Newcastle upon Tyne in Championship 2nd place, after an explosive first Round in Manchester! 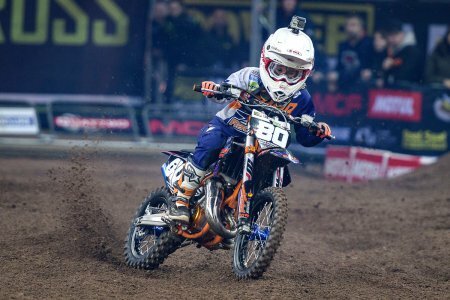 At just 8 years old and the youngest rider in the competition, Zane took the first ever race win for the Judd Orange Brigade, with a 1st in Race 1 at the Manchester Arena. He followed this up with a hard fought 4th in the evenings Race 2, to sit in 2nd place in the Championship. Not bad for the start of his first year on a 65 after moving up from the Auto's, and his first race for the Official KTM UK Factory MX Youth Team - the Judd Orange Brigade! Knowing Zane, he'll be hoping to go one step further at the Metro Radio Arena tomorrow, and we wish him all the best of luck at the Newcastle Round 2! Zane Stephens is the current ACU British Auto Champion 2017, and can be seen further below - 'living the dream' - having photo's with members of the audience between races, and immediately below being interviewed by Arenacross presenter Matt Crowhurst. 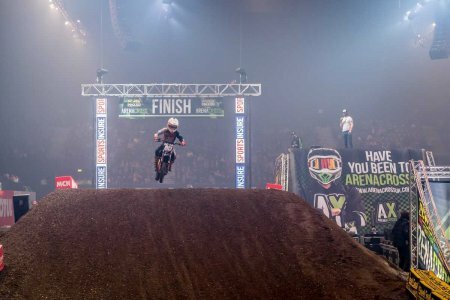 If you'd like to see the Judd Orange Brigade rider Zane Stephens competing at one of the rounds, then check out the full list of Arenacross tour dates with ticketing information at arenacrossuk.com. Arenacross 2018 Round 1 Interview with Judd Orange Brigade 65 rider Zane Stephens. 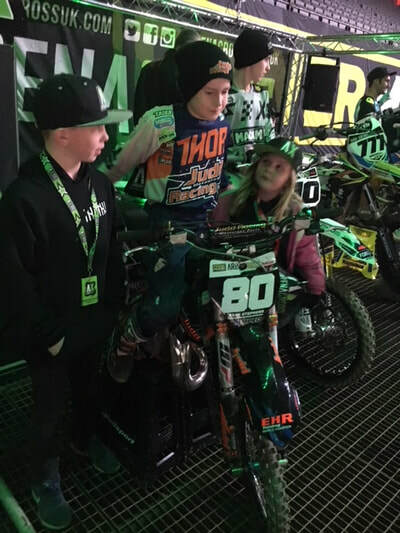 Judd Orange Brigade 65 rider Zane Stephens, poses for photo's with the public at Arenacross 2018, Round 1, Manchester Arena. 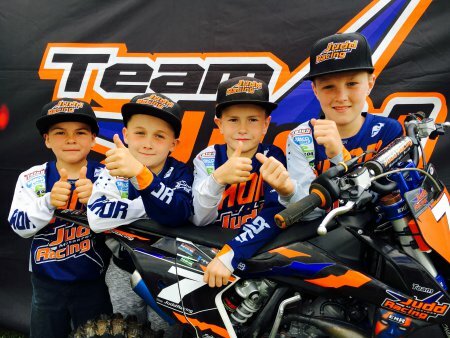 Team Judd Racing become the Official KTM UK Factory MX Youth Team! THE JUDD ORANGE BRIGADE IS BORN! 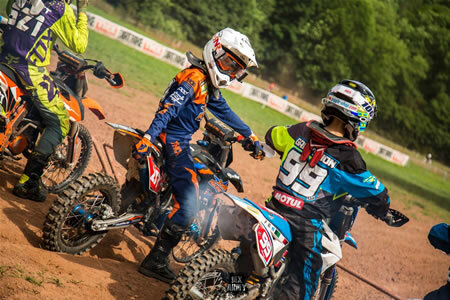 KTM UK is launching an official UK motocross youth team to provide talented junior riders with the opportunity of a support structure to develop their careers to the highest possible level. With the largest available motocross range for youth and adult riders and an unmatched commitment to racing, the Austrian brand has always been a big supporter of nurturing young talent. The opportunity for KTM UK to create a dedicated team to run in the British Youth Nationals (BYN) came after a shared vision with youth MX parts specialists, Judd Racing. The collaboration – which is a 3-year minimum term between Judd Racing and Silverstone-based KTM UK – will operate under the official title of the 'JUDD ORANGE BRIGADE – The Official KTM UK Factory MX Youth Team'. The two parties will work together to provide an opportunity for youth riders to progress through the ranks with KTM to adult professional status. The team will cater for riders placed in categories throughout the youth range of disciplines, from 50cc, 65cc, 85cc small wheel, 85cc big wheel, 125cc, up to 250cc. Successful squad members will get to run under the team’s set-up at BYN events and take advantage of the comprehensive support KTM UK and Judd Racing can supply. Race machines will be available at a subsidised cost and will then be decked out with KTM PowerParts with riders wearing full KTM PowerWear. A healthy spares budget is also incorporated into the package. 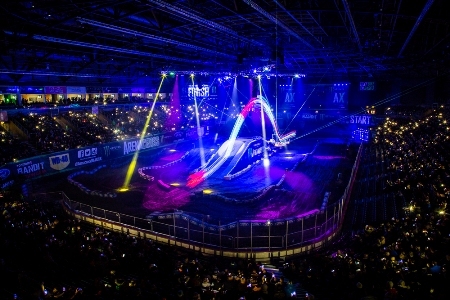 Riders can also race under team colours at other championships on dates that do not conflict with the Judd British Youth National Championship. Michelle Arnold, Managing Director of Judd Racing, said: "This is a great opportunity for young riders and it's something we've wanted to develop for many years. This kind of impetus is what Judd Racing feels the sport needs to push it forwards and help riders evolve and compete on an International level. We're very excited for the future." CHAMPIONS! Wins all round & Championship Titles for Team Judd Racing Riders! 2017 85sw Champion Bailey Johnston also picks up his Rider Of The Year Trophy! Zane Stephens (centre) takes the top step to become the Auto 7-8 ACU British Champion! Archie Britton holds his 1st place plaque, presented to him by European 300EMX Champion - Brad Anderson! What an absolute flyer Team Judd Racing had at the Final Round of the Judd Racing British Premier Cup this weekend! It could hardly of been any better with all of the team riders excelling in both the Round and the Championship combined! 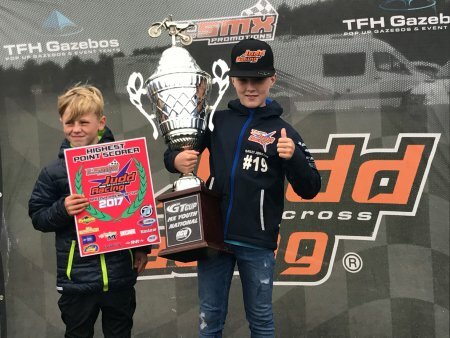 The 1st place podiums, Championship Titles and even the largest trophy up for grabs, did not go begging at Sherwood MX Track in a dream weekend for Team JR! Bailey Johnston Won the Round in the 85sw class, became the '2017 85 Small Wheel Champion' AND then followed it up to also Win the 'Rider Of The Year' Trophy for most points scored in the youth classes! Outstanding! In the 50cc category, auto ace Zane Stephens also took 1st to win the Round & was crowned the '2017 ACU British Auto 7-8's Champion' to a hail of bubbly! Thanks for sharing Zane! 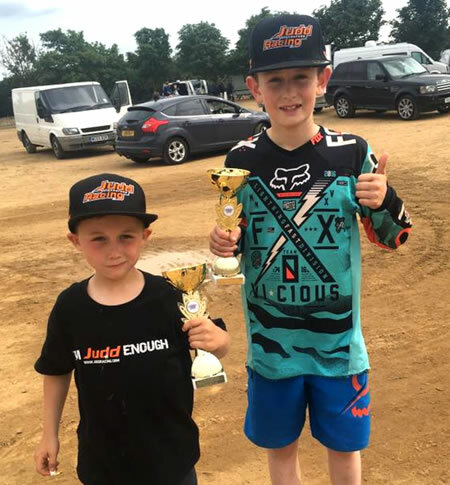 The youngest Team Judd Racing rider Archie Britton also had an amazing ride, again winning the Round, and by doing so reduced a 22 championship point deficit to just 10 points, to finish as Championship Runner Up in the Auto 6-7's. A fantastic result for his first year! We cannot begin to say how proud we are of our riders and their achievements this year - truly awesome! Thank you to all of the Teams Judd Racing sponsors, who as always have been great in their support. We hope we've done you proud! 7T Racing, EHR Performance Parts, Grasshopper Custom Printing, HGS Exhausts, Judd Racing Youth Motocross Parts, Pro Green MX, Rock Oil, Samco Sport, Talon Engineering, Thor MX. 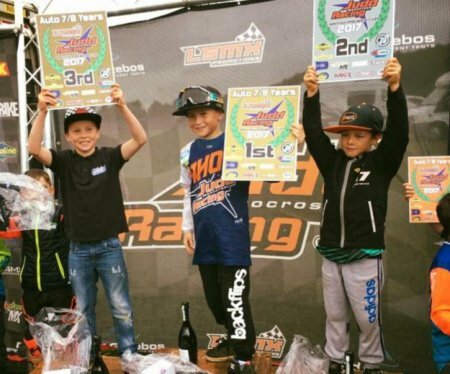 Team Judd Racing Riders retain Championship 1st's at Judd Cup! What a difference a Round makes! 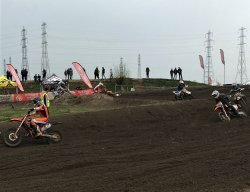 In contrast to the heat of the last round of the Judd Racing British Premier Cup, Round 3 brought with it some very wet overnight weather, to create tricky conditions at Fat Cat Moto Parc in Doncaster. This didn't deter the riders of Team Judd Racing though, or their fellow competitors as they battled it out in the wet terrain. 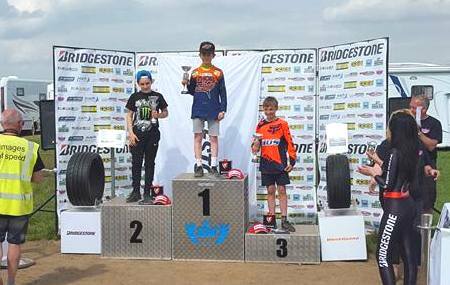 First up for the fight was under 6-7's Auto rider Archie Britton, who opened up with a category win, and followed it up with three 3rd's and a 4th to retain Championship 1st, and a 3rd step on the podium for the weekend. His compatriot in the upper aged 7-8's Auto's Zane Stephens, took an 8-2-10-7-4 score card for 5th overall, and notched up enough Championship points to also retain his 1st place position! In the 65 Juniors Spike Stevens continues to improve his overall positions with each round. Round 3 saw him jump to a 10th overall, the results of his 4-5-15-11-10 hard earned endeavours. This now moves him to 12th in the Championship! Bailey Johnston stretched his 85 small wheel Championship lead to 61 points after the Doncaster weekend, taking the top podium step with two 1st's, two 2nd's and a 7th. The latter the result of an off towards the start of race 3, where he managed to race back through the pack and up the leader board. Another great weekend from all the riders of Team Judd Racing, each of whom continue to be an exemplary credit to their Team and their sport. Thank you as always to all of our fantastic Team sponsors for your help & support: 7T Racing, EHR Performance Parts, Grasshopper Custom Printing, HGS Exhausts, Judd Racing Youth Motocross Parts, Pro Green MX, Rock Oil, Samco Sport, Talon Engineering, Thor MX. Spike Stevens turns up the heat in the 65's! Spike & Bailey waiting to race at the Judd Racing British Premier Cup 2017! 3 Podium's at Little Silver for Team Judd Racing! Bailey Johnston jumps into Championship 1st! Zane Stephens now just 8pts off the lead in the Auto 7-8's! Archie Britton battled into 2nd place in the Auto 6-7's! It was glorious weather at Round 2 of the Judd Racing British Premier Cup, and the sun definitely shone on Team Judd Racing, as the boys racked up a great set of results yet again! Newcomer to the Team and 6-7's pilot Archie Britton settled in perfectly scoring 4-5-2-1-2 and 2nd place overall in the 6-7 Auto's. It also means he's now 1st in the Championship! Co-auto rider but in the 7-8's Zane Stephens also put himself on the second step of the podium with a brace of wins, two 3rds and a 4th. He now sits 8 championship points off the top in 2nd place. In the 65's and in his rooky year Spike Stevens put in a gutsy performance breaking into the top ten for the first time with a 9th in race two. An off in race four pulled his overall position down to 14th which was still a great result considering. In the small wheel 85's Bailey Johnston stole the show with four 1st's and a 2nd to win Round 2 and storm into a 51 point lead in the Championship. He'll be looking to take this type of form into the next round of the British Youth Nationals at Desertmartin later this month. High Five for Bailey at BYN's, while Zane burns rubber at Bridgestone's! 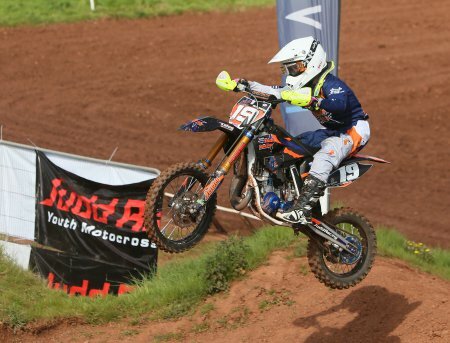 Team Judd Racing SW85 Rider Bailey Johnston got into the action at the British Youth Nationals this weekend. 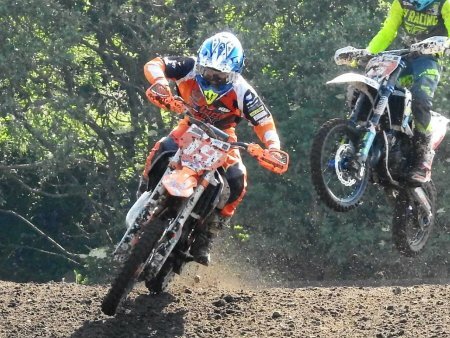 Culham MX Park near Oxford hosted Round 1 of the championship on a circuit that had undergone a lot of work following on from the Maxxis British Championship the previous week. Five races over the weekend resulted in a 4th, 4th, 5th, 5th and 6th to earn Bailey a hard fought and well deserved 5th overall. 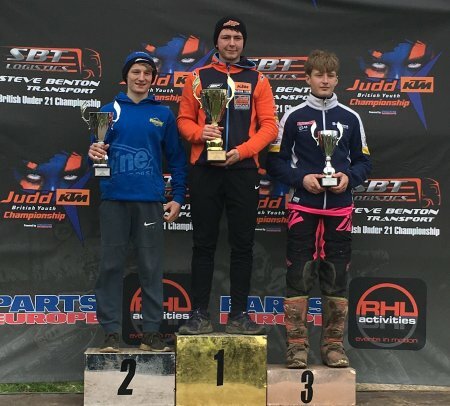 It was also the championship opener at the Bridgestone BSMA's in Wroxton where Auto Team rider Zane Stephens scored an 8th, 7th, 5th, 13th, and 4th card for an overall 7th place. Zane rode better than his results may suggest, an example of which was his charge from last to 13th place in race four. Good solid starting championship positions from both riders, which they'll be able to build upon as the season unfolds. Well done boys! #80 Zane Stephens in the Team Judd Racing Pit Tents with his pristine Auto! Team Judd Racing kicks off the 2017 Season with a flyer! 85SW Bailey Johnston moves into Championship Lead! What a great start to the Motocross Season with Team Judd Racing on 2 Podiums and a Championship Lead.! Preston Docks was the track that hosted Round 1 of the Judd Racing British Premier Cup 2017 for a sizzling opener. Bailey Johnston (the 2016 65's Judd Cup Champ) starred in the SW85's not dropping out of the top two prositions all weekend. His 2-2-1-2 card gave him 2nd overall for the round and an excellent 18 point Championship lead! In the Auto 7-8's Zane Stephens showed his speedy consistency with a 3rd, 1st, 2nd and a 3rd to put him on the 2nd step for the weekend, and firmly in 2nd place in the Championship title race. Spike Stephens took on the 65's in his first year in the category. His dogged performance after a couple of off's gave him two solid 12th positions, a 21st and a 25th, to put him in 19th place. A fantastic start to the series for Team Judd Racing and the beginning we're sure, of what will be a great season. We'd like to thank all or our 2017 Team Judd Racing Sponsors for all their help and assistance. They're some of the best companies in the business and we couldn't do it without you! 7T Racing, EHR Performance Parts, Grasshopper Custom Printing, HGS Exhausts, Judd Racing Youth Motocross Parts, Pro Green MX, Rock Oil, Samco Sport, Talon Engineering, Thor MX. Todd Ritchie moves to 1st in BYN Championship! Todd Ritchie powers to 1st in Championship! Todd Ritchie takes 2nd on the podium & secures the Championship lead! A brilliant 2nd place overall at the weekend means that Todd Ritchie now leads the Thor British Youth Nationals in the 125 category! 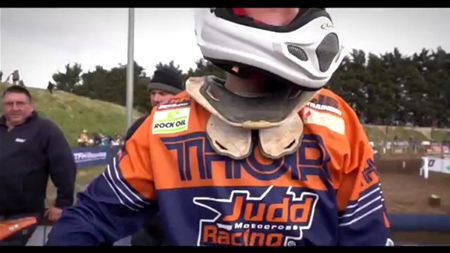 Round 3 of the Thor BYN's took place on the deep sand track of Leuchars in Scotland on the 9th & 10th July 2016, and the 822 mile round trip turned out to be a worth while journey, not only to Fife but also to the very top of the table for Team Judd Racing's 125 ace! A mixed first day saw the pressure tell for Todd with him carding a 5th and a 3rd in races one and two, but day two was a different story and three straight 2nds gave him 2nd step on the podium overall and with it a top of the Championship position! 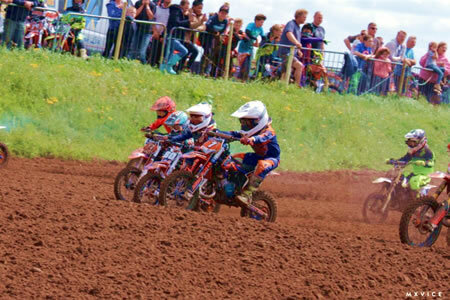 The Thor British Youth Nationals have three rounds remaining, with the final round scheduled on the 24/25 September at Cusses Gorse. Todd Ritchie's next BYN race will be at Milton Malsor, Northampton on 27/28 August for Round 4. Want to take a look at Todd Ritchie's 125? Then visit the video's page for a sneak peek! 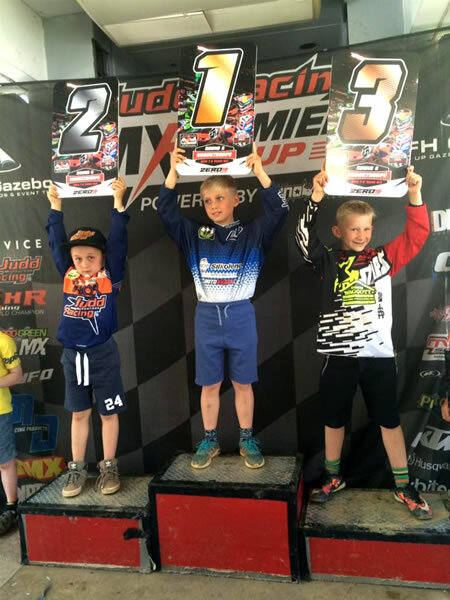 Podium finishes for young guns at Judd Cup Round 6! Spike Stevens (above left) takes 2nd step on the podium in the Auto 7-8's! 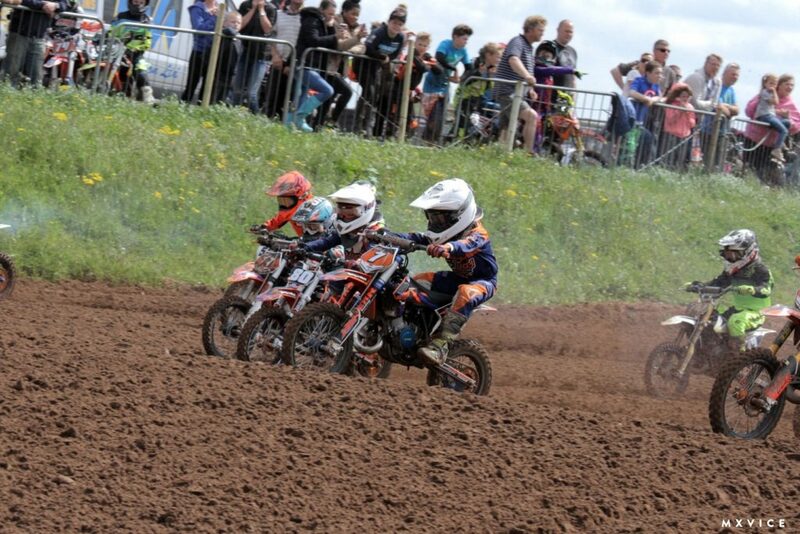 An intermittent Saturday and red hot Sunday were the weather conditions for this weekends Round 6 of the Judd Racing MX Premier Cup at Brookthorpe MX in Gloucester. Team Judd Racing still shone with two podium finishes and a 7th, even though they were down yet another rider, with Ben Clark sidelined in the SW'85's with a broken tibia and fibula, prior to the round. With both Colmer in the 65's and now Clark in the SW85's injured, the remaining three Team riders took to the track with renewed vigour. In the 6-7 Auto's Zane Stephens kept his cool to secure a 3rd overall. Spike Stevens set the scene by winning the first race of the meet and gaining 2nd overall, while Todd Ritchie battled hard in a tough 125 category to secure 7th! Yet again another good round & weekend for Team Judd Racing. Bring on the 7th and final Round! Zane Stephens (above) holds his 3rd place for the 6-7 Auto's, while Team tyre sponsors 'Gibson Tyres' get in on the pic! It's 1st and 1st for Stevens & Clark at 90 Racing MX Championship! Spike Stevens (above left) & Ben Clark (above right) show off their '90 Racing' Auto & SW85 Winners Trophies! With a fortnight before the Team's next official outing at Round 6 of the Judd Racing MX Premier Cup, two of the riders Spike Stevens (Auto's) & Ben Clark (SW85) decided to keep their racing on point, with a wild card entry to Round Four of the 90 Racing MXC Championship. 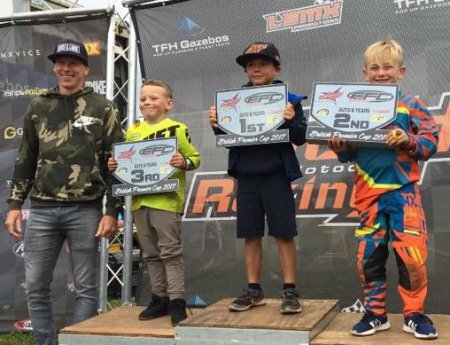 The round which was held at WildTracks in Chippenham, saw both riders take maximum points with a 1-1-1 card each, to take top steps on the podium for the overall wins in the Auto's and the SW85's respectively. Well done boys, let's hope you can repeat that at the Judd Cup R6! Team Judd Racing's Spike Stevens is No.1 on the Auto's podium! Ben Clark moves up to 2nd in Judd Championship! There's no looking back for Team Judd Racing's Ben Clark in the SW85's as he moves up to 2nd in the Series! Round 5 of the Judd Racing MX Premier Cup took place down near the Welsh border, 7 miles south west of Hereford at Pontrilas MX Track at the weekend. 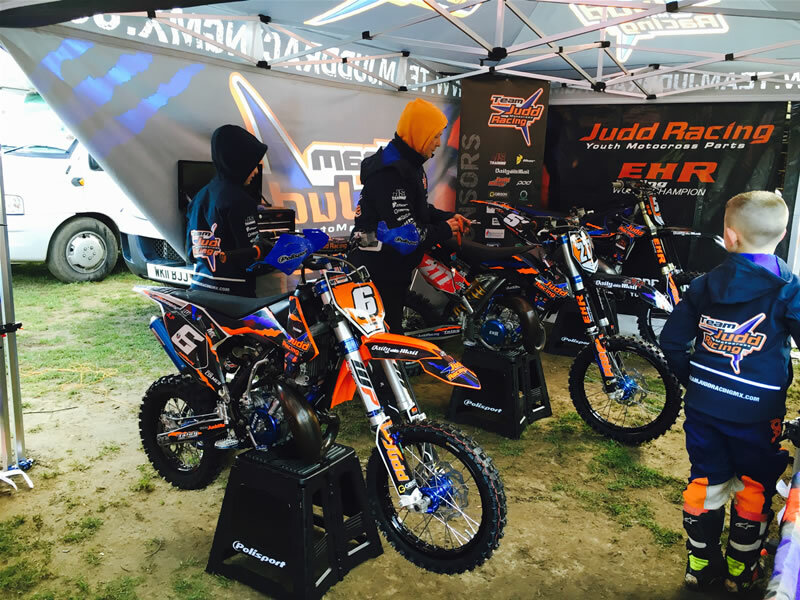 Team Judd Racing were there in force although it was a mixed weekend for the orange & blue emblazoned riders. The main concern was for Todd Ritchie on his 125, who sustained a concussion in Race 3 and an inevitable DNF as a result. With three races being ran on day one, it meant he had a night to recoup before the final two. The gutsy rider took back to the track the following day for Races 4 & 5, but it was clear his recovery wasn't complete when he retired in the final race. Two DNF's meant an unacustomed 14th place overall for Todd, but the good news is he's still in one piece and knowing him will be fired up for a come back in the next round. Ben Clark and Spike Stevens both accomplished podium 3rd places overall in the SW85's and Auto 7-8's respectively. Ben totted up a 3,3,4,3,5 card which means he jumps up two places from 4th to a brilliant 2nd in the Championship! Spike won race 3, took a 2nd in race 4 and added two 3rds and a 4th to complete a weekend which maintains his 3rd Championship place. Zane Stephens in the Auto 6-7's, had an out of character Round 5, with a 5,8,3,2,9 score card that gave him 5th overall. Zane now sits 2nd in the Series. 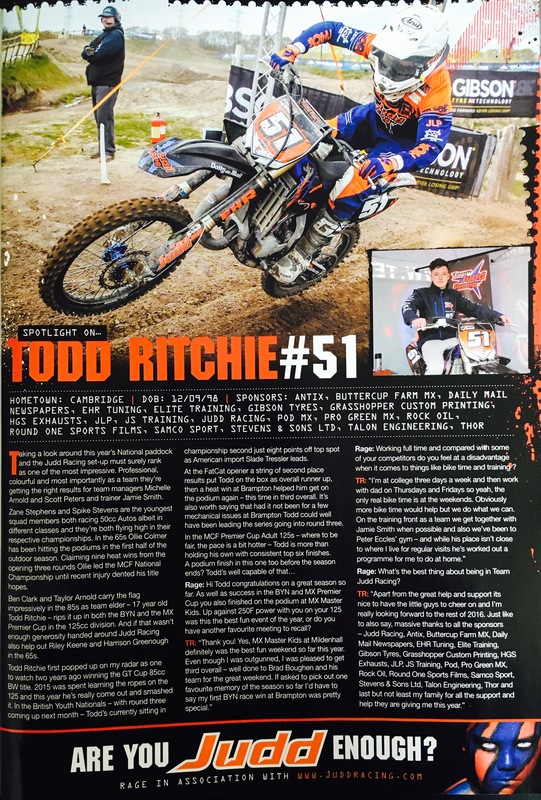 Dirt Bike Rider Magazine - Features Todd Ritchie, Team Judd Racing's 125 Ace! Clark Shares TMX Front Page With Roczen & Simpson! 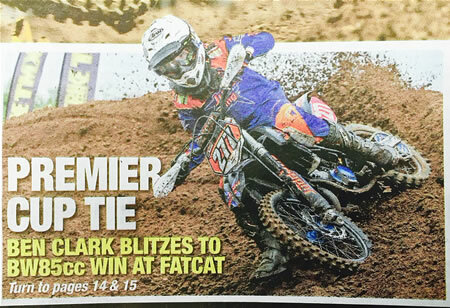 Team Judd Racing rider Ben Clark, get's in on the news by appearing on the front cover of this weeks TMX News! 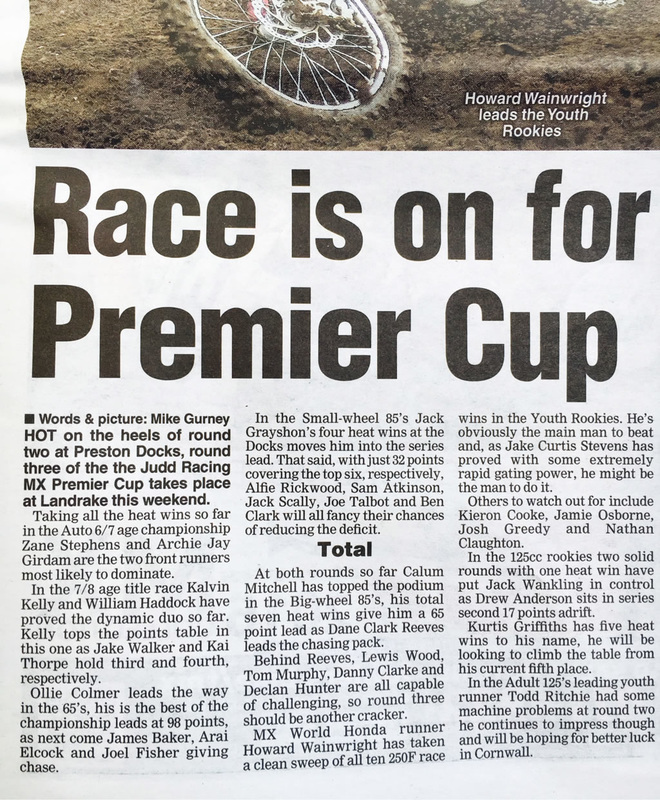 The 85 small wheel rider (yes the TMX made a typo) features on the front page of Thursday 26th May 2016's edition, as a headline for the two page feature and race report for Round 4 of the Judd Racing MX Premier Cup. 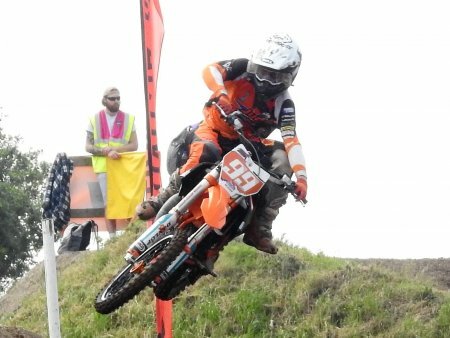 Ben and his Team mates competed at the 4th round of the National Championship, which was held at Fat Cats Moto Parc in Doncaster. Clark ultimately winning the SW85 round to take top step on the podium! Clark Wins Judd Cup Round 4! Ben Clark takes 1st in the SW 85's! 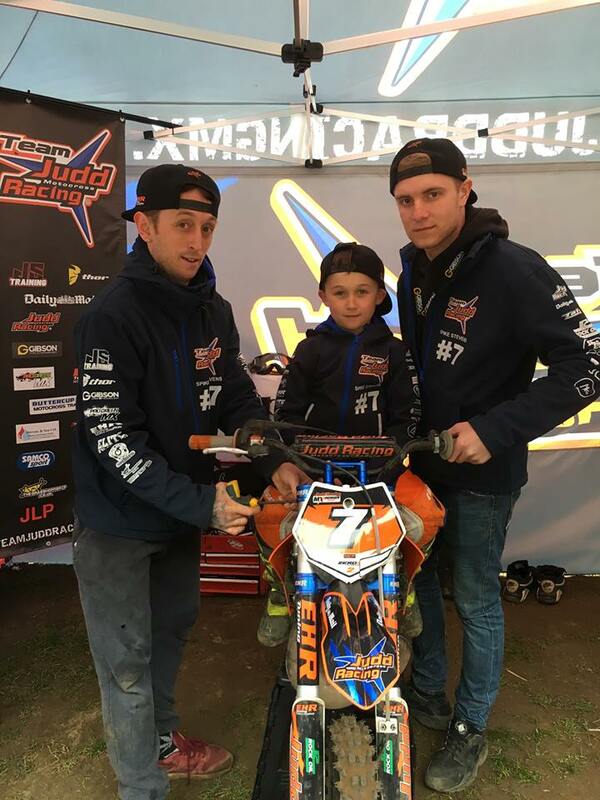 21/05/16 - It was an excellent 1,2,3,4 for Team Judd Racing at Doncaster's Fatcats this weekend for Round 4 of the Judd Cup Racing MX Premier Cup, as the riders continue to hammer the podium steps and top positions. 1st! They say consistency wins championships, well that plus some great riding from Ben Clark won him Round 4 of the Judd Racing MX Premier Cup in the SW 85's! Ben made his home track advantage count as he logged results never dropping out of the top two, with a 2,1,2,2,2. The top step was his and deservedly so. The round 4 win maintains his position of 4th in the Championship, but lifts his points tally to within just 5 points of third place. 2nd! In the Auto's 6-7's Zane Stephens was on form and clocked exactly the same set of results for his category as Ben Clark but in a different order with a 2,2,2,2,1. It gave Zane 2nd overall and means he remains 1st in the Championship. 3rd! Again in the Auto's but the 7-8's, it was Spike Stevens who's 4,2,4,6,3 card gave him an excellent 3rd place on the podium, and moved him up a Championship position to 3rd place. 4th! Todd Ritchie in the 125's secured 4th overall with no less than 3 holeshots and a 6,3,3,3,4 card. To say it was close would be an understatement as he finished on joint points with 3rd place. With yet another solid performance from Todd it's no surprise he's now risen two places to Championship 4th. It's yet another great round from all the Team, although there was one member missing! We wish a speedy recovery to our 65 ace Ollie Colmer who sustained a broken femur during training prior to Round 4 and was understandably unable to race. Get well soon buddy, it wasn't the same without you! Team Judd Racings next official race will be at Pontrilas, HB2 0BG, UK on 11th & 12th June 2016 for Round 5 of the Judd Racing MX Premier Cup. Ben's Back With A Bang & Zane Racks Up A 4th! Ben Clark Wins the Bridgestone BSMA Championship, Round 3 at Fatcats! 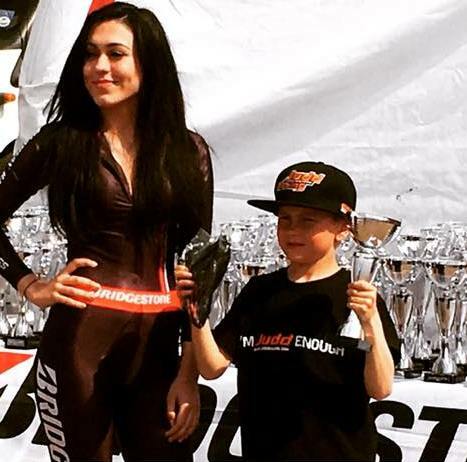 Auto rider Zane Stephens only has eyes for trophies as he picks up a 4th at the Bridgestones! 14/05/16 - He might be riding on and being sponsored by Gibson Tyres, but recently back from injury Ben Clark took no time in getting back in the swing of things by winning Round 3 of the Bridgestone BSMA Championship in the SW85's at Fatcats. Entered as a wild card due to other commitments in other championships with Team Judd Racing, Ben clocked up an excellent 1,2,1,1,2 card for a well deserved overall weekend win! 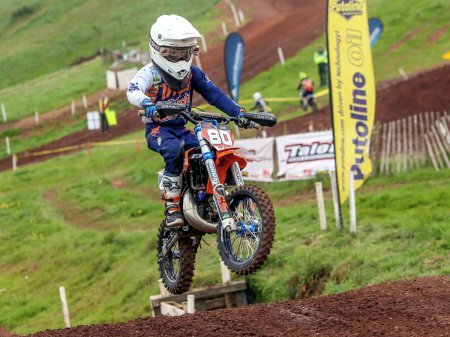 Also taking part but in the Auto's was the Team's youngest rider Zane Stephens, who just turned 7 years old before the weekends racing. Zane qualified 1st and posted a 2nd,3rd,4th, & 5th, but it was race 2 with a mishap that gave him a 13th place that dropped him points for a step on the podium. Even so Zane still finished in 4th overall! This all bodes well of course for this forthcoming weekend, which sees the Judd Racing MX Premier Cup band wagon roll into Fatcats for Round 4 of the National Championship. So a very nice warm up indeed for Ben & Zane on the same track. 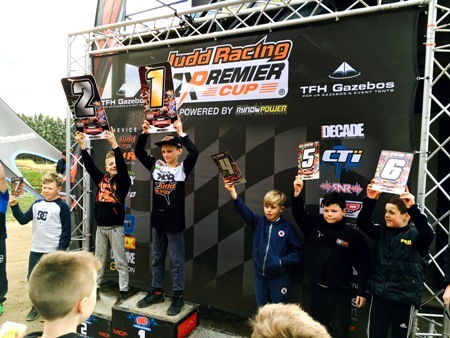 Judd Cup Round 3 sees more Podiums for Team Judd Racing! Ollie Colmer lifts 1st in the 65's! Todd Ritchie flies the flag for his EHR tuned YZ125! Spike Stevens (above L) & Zane Stephens (above R) take 2nd & 1st in the Auto 7-8's & 6-7's respectively! 07/05/16 - Team Judd Racing headed to Cornwall, good weather and Landrake as the destination for Round 3 of the Judd Racing MX Premier Cup. Zane Stephens carried on where he left off from Round 2, by winning the 6-7 Auto's at Landrake! His category 3,1,1,1,2 card gave him a podium topping 163 points for the weekend. Zane is currently leading the 6-7's Championship by 13 points. In the 7-8 Auto's it was an oh so close weekend for Spike Stevens, when he opened day one with two 1st's. An off however in Race 3 gave him a 5th, which was enough of a points drop to put him 2nd overall, despite posting two 2nd's in the final two races. He also set the fastest lap for the weekend and was absolutely flying. Ollie Colmer reigned supreme in the 65's with four 1st's and a 2nd in the last race, to wrap up an excellent display and the overall win. Ollie continues to lead the Championship standings with 661 points, currently putting him 58 points clear. In the small wheels #277 Ben Clark was back from injury, but easing himself back in, posting a highest race finish of 7th. However the weekend put him 9th overall and the 158 points he picked up will be crucial to his Championship challenge, where he currently sits 4th. Todd Ritchie's superb 2nd place in Race 2 of the 125's was a personal best in the Judd Cup so far. He'll be looking to repeat this in the forthcoming rounds, especially at Fat Cats in Round 4. Todd posted a 5,2,5,5,6 card finishing Round 3 in 6th overall. Ben Clark rips it up in the SW85's! Ollie Colmer leads the chase for the holeshot in the 65's! 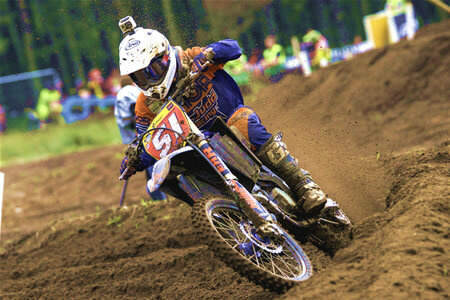 Auto rider Spike Stevens gets his photo in TMX this week! Nice mentions for Team Judd Racing riders Zane Stephens, Ollie Colmer, Ben Clark and Todd Ritchie in this weeks TMX , as it previews Round 3 of the Judd Racing MX Cup. 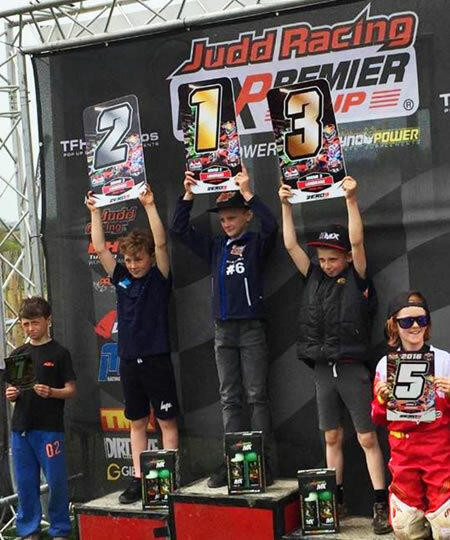 Two Podiums & Fastest Lap for Team Judd Racing at HCR MX Master Kids UK! Todd Ritchie on his 125 gives the 250's a run for their money! Spike Stevens gets ready to set the Fastest Lap in the Auto's! Spike Stevens with 3rd in the Auto's! 30/04/16 - Todd Ritchie battled the more powerful 250's with his Team Judd Racing YZ125 at the MX Master Kids UK this weekend, to earn himself 3rd step on the podium overall in the Seniors. Second only to Dylan Woodcock & Dexter Douglas, it was Ritchies excellent and consistent riding that put him in the top three and deservedly so. Spike Stevens in the Auto's also took 3rd place overall, hitting podium yet again. He also set the fastest lap in the Auto's with a sizzling 01:59.269 time! To put this into context there were only six riders in the 65's (the next bike category up) that set faster times than this and there were 99 riders in the 65's competing! It was all so tantalisingly close to a higher step though, with Spike running in 2nd position in the final race, until an off left him in 10th. It was that final race that dropped crucial points, but hey that's motocross! His weekends card finished 2,3,3,1,3,10. 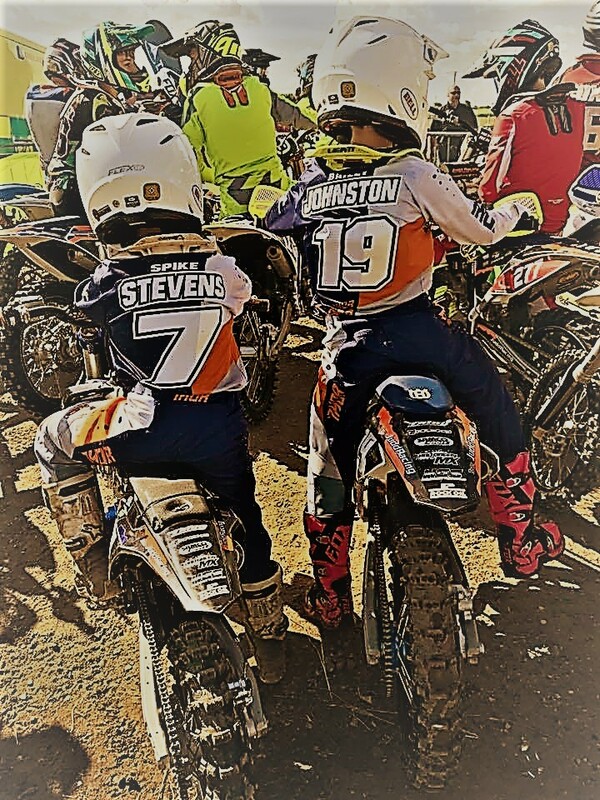 There were 74 Auto riders competing at the Master Kids at Mildenhall and at only 6 years old new addition to the Team Zane Stephens still managed to qualify in the A group. The little battler who only last week lifted 1st place at the Judd Cup Round 2 also posted the 9th fastest lap time and finished 12th overall! Pretty cool for only 6 against older riders! We'd like to thank Brad, Roland and all the organisers of the event, once again for a great weekend! The full contingency of five Team riders will be competing at Round 3 of the Judd Racing MX Premier Cup at Landrake this coming weekend 7th & 8th May 2016. New Team Member Lifts Overall 1st at Judd Cup Round 2! New Team Judd Racing rider Zane Stephens, triumphantly holds his 6-7 Auto's, 1st place placard aloft! 23/04/16 - It was the North West and Preston Docks was the location this week for Team Judd Racing, as they contested Round 2 of the Judd Racing MX Premier Cup. The Team though had a new little addition to the team, in the form of 6 year old Auto rider Zane Stephens. Zane was the first Team rider out on the track and he rode exceptionally well all weekend. He set the 8th fastest lap out of 44 autos in qualification and 2nd out of the 6-7 Auto category. A good consistent weekend saw Zane take two 1st's and two 2nd's in the 6-7 Auto's for the overall win! His first for the Team! In the same race - but the 7-8 auto group - fellow Team rider Spike Stevens was having another mixed weekend with a few bike problems. Spike gave it 100% effort and never gave in once. His best race result was a second in the last moto to give him 9th overall in the 7-8 Auto group. 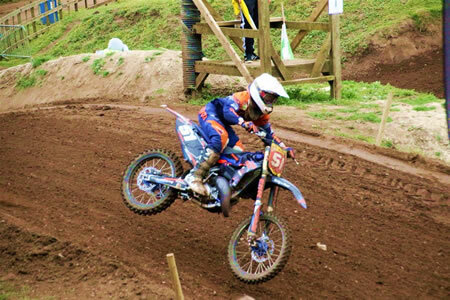 Next up were the 65cc's where it saw Ollie Colmer fighting hard for every point, after struggling with some unfortunate starts. Ollie worked really hard and finished on the 2nd step off the podium. It was a close call for top step, as he finished on joint points with the leader. Those points though means he still leads the Championship heading into round three at Landrake in two weeks. 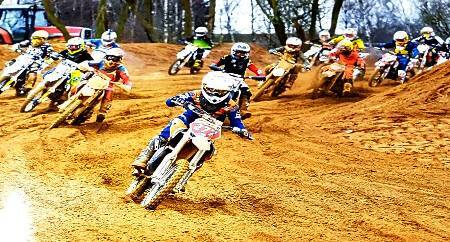 In the small wheel 85cc group Team rider Ben Clark was back after an ankle injury. Ben rode really well on the first day and was leading the points going into Sunday, but unfortunately in the first race of day two Ben stubbed his foot in one of the corners and twisted his ankle again. This was to end Ben's weekend early and we wish him a speedy recovery. Technical issues once again came to haunt Todd Ritchie in the 125's. After a 4th & 5th in the first two races, a piston ring broke into bits on his YZ125 meaning a DNF for race 3. Todd's 2nd bike is currently out of action so it looked like a premature end to the weekend until fellow 125 rider Aaron Framingham stepped up and loaned him his spare bike. Todd duly finished the final two races with a 6th and an 8th to finish round 2 in 11th and 6th in the Championship. A huge thank you once again to Aaron Framingham from all of Team Judd Racing. A true sport and what motocross is all about! 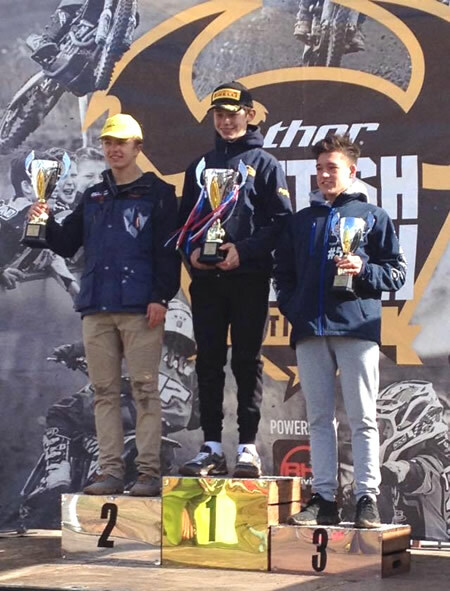 Ritchie Hits Podium Again At Thor British Youth Nationals R2! 16/04/16 - The British Youth Nationals moved north for Round 2 this weekend to Brampton in Cumbria. Adverse weather made for tricky riding conditions, with everything from snow, hail & sunshine being thrown at the riders to test the best in Britain. Team Judd Racing were down a rider with Ben Clark having sustained ligament damage to his left ankle the week prior at a club meet. 125 Flyer, Todd Ritchie, though took the helm for the Team with a 3rd overall for the round and his first ever British Nationals win during Race 2! It wasn't plain sailing though, with tough competition and a puncture in Race 3 which saw his rear tyre shredded as a result. Picking up 187 points, places Ritchie perfectly in 2nd in the Championship and just 8 points off the leader. SW85 Ben Clark eyes a return this coming weekend! Ollie Colmer in the 65's ran a 5-3-8-5-5 card over the weekend to end 5th overall, but the crucial 181 points he clocked up secures him Championship 3rd. All in all, a good weekend for Team Judd Racing! The other good news is we're hoping to have previously mentioned SW85 rider Ben Clark (pictured right) back on the bike for the upcoming Round 2 of the Judd Racing MX Premier Cup at Preson Docks. Clark currently holds 3rd place in that Championship. Stevens puts on a show for 1st, and Ritchie wraps up 2nd! Auto Ace - Spike Stevens wins! 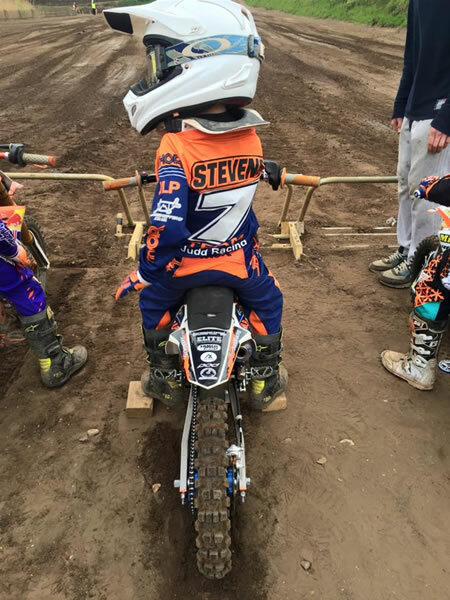 10/04/16 - Aged only 8, he's the youngest in the Team but Spike Stevens gives no ground when it comes to racing! 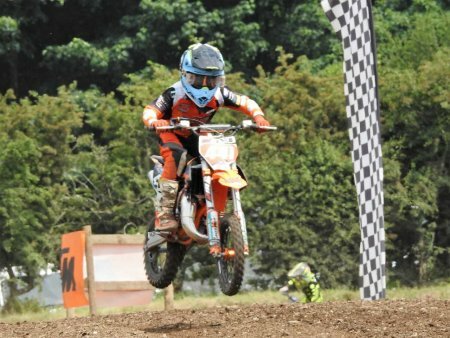 He swept the board at the EASSC Summer Championship 2016 Round 2 this weekend at Buttercup Farm MX track in Chatteris, with three out of three holeshots and three out of three wins to take 1st overall in the Auto's! As reported in the TMX this week "Spike Stevens put on a show, taking all three wins with ease"! At the same event in the 125's Todd Ritchie won the first race of the day, then battled hard in the second and third race to go 1-2-2 for 2nd overall! Yet again, well done boys! Team Judd Racing Take Two Podiums at BYN R1! 02/04/16 - Round one of the Thor British Youth Nationals rolled into Fatcats Motoparc in Doncaster, to commence this years Championship challenge, and it was an ecstatic, solid, and mixed weekend for the Team Judd Racing Riders. Out first flying the flag for Team Judd Racing was Ben Clark. Ben had an up and down weekend with his best result a 4th and his lowest a 12th, and regardless of an issue with his starts still placed 6th overall. Ben is looking forward to round two, where he will be hoping for better results and a return to his usual top form. 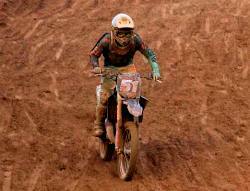 Next up was the 65cc class. Ollie Colmer (pictured above) had a good consistent weekend finishing in the top five in every race to take the third step of the podium overall. In fact a great GoPro video of Ollie having a problem on the start line, but then tearing through the pack as he catches them up is currently circulating on youtube, and well worth a look. In fact you can see it on our Team Video's page here. Last but by no means least was Todd Ritchie (shown far left) in the 125cc class. Todd had an amazing weekend and his best result to date! Todd finished inside the top three in every race with an impressive 2,2,2,3,2 card to secure him second overall on the weekend! Great riding boys! Want to see Team Judd Racing live? 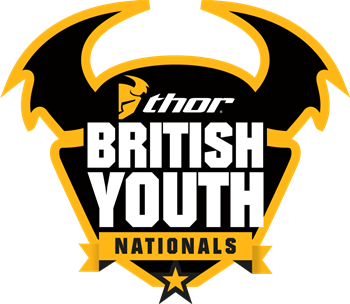 Then catch up with them at their next outing - the ﻿Thor British Youth Nationals R2﻿ at Brampton, Cumbria on 16th & 17th April 2016. The National Season Begins for Team Judd Racing! 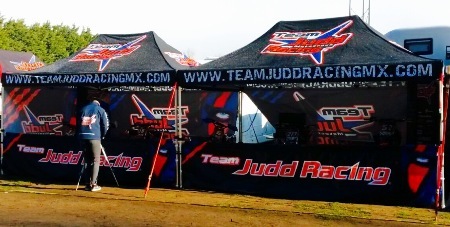 Standing out from the crowd, the new Team Judd Racing Pit Tents! Ben Clark leads the way! Todd Ritchie in the 125's! Riley Keene inside the Team Pits! Spike Stevens (centre) with crew! Ollie Colmer takes 1st overall in the 65's! 19/03/16 - The full Team Judd Racing were present at their first National Championship - the aptly named & sponsored - Judd Racing MX Premier Cup, which was held at Mildenhall, this weekend. Spike Stevens (Auto), Riley Keene (65's), Ollie Colmer (65's), Ben Clark (85SW's) and Todd Ritchie (125's) were all looking hot to trot in their new Team Judd Racing Kit and Pit Wear, emblazoned not only with the Team logo, but the logo's of every one of their sponsors! The new Team Pit Tents also took pride of place, looking the biz with sponsors banners and matching tool kit tables & bike stands! So it was finally here, the first round of the Judd Racing MX Premier Cup at Mildenhall. All of the Team Judd Racing riders met up with Team Manager Jamie Smith bright and early to walk the circuit on Saturday morning. All were in high spirits, as they had worked hard training during the off season, to prepare for the first round of racing. The Team were all pleased with how the Judd Racing MX Premier Cup staff had prepared the Mildenhall circuit. The days racing started nice and early as they all headed out for practice at 9am. Due to a technical fault, there was to be no qualification during Saturday's practice, but the Teams Manager was happy with the potential all riders showed during free practice. The first class up to race was the Auto class, with Spike Stevens representing Team Judd Racing. As there was no qualifying during free practice, the first gate pick was going to be a lottery, as they were to pick a peg from a bag. Unfortunately, Spike drew peg 34, which was not to help him, but gate pick was the least of Spikes worries as he was haunted all weekend by bike problems!! However in race three Spikes bike managed to stay strong and he took his first win of the season! Meanwhile in the 65 class, Ollie Colmer was flying the Team Judd Racing flag as he managed to claim first overall, at the first round of the Judd Racing Premier Cup! His team mate Riley Keene also in the 65 class, was having a mixed weekend with his best finish of 5th in race one, to claim 10th overall on the weekend but showed some good speed and promise for the rest of the season. Ben Clark in the 85 small wheels had a consistent weekend, claiming four 4th's and one 3rd, to finish on the 3rd step of the podium for the weekend. Seventeen year old Todd Ritchie was in for a tough weekend in the 125 2 stroke class, as he was competing against all aged adults, but that was not to phase him as he managed to secure a top 5 finish overall for the weekend with a 5th place! Well done to all the riders! All in all a solid start from the Team, and a good footing to move forward to Round 2! Want to see Team Judd Racing live? Then catch up with them at their next outing - the Thor British Youth Nationals at Fatcats, Doncaster on 2nd & 3rd April 2016. 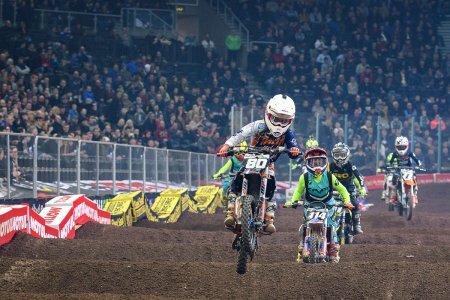 Colmer Wins Wembley Arenacross & Secures 2nd Place in Championship! 27/02/16 - It was a fantastic night for Team Judd Racing 65 Rider Ollie Colmer as he rode to victory at Wembley. 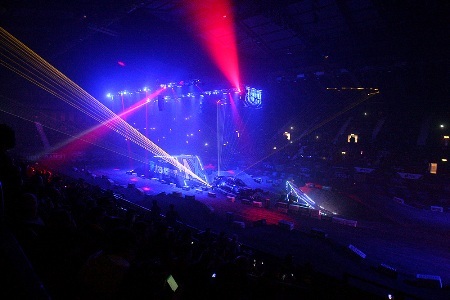 Arenacross wrapped up this years outing with it's 11th and final round, which took place at London's SSE Wembley Arena this weekend. Ollie went into the final tie only 1 point adrift of top Championship spot, but it was always going to be close! A 2nd place in the early race kept the pressure on, and he followed this up with a sensational 1st in the evening main race, to take 1st for the Round and win Wembley. 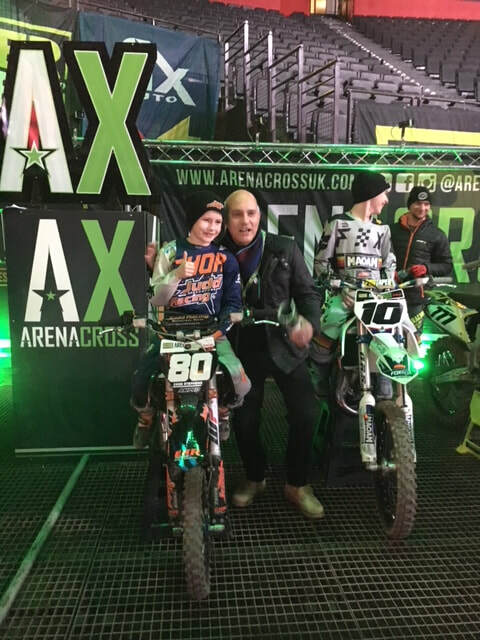 However the points weren't enough to take the Championship title, but after a hard fought and superbly ridden campaign, he retained 2nd place overall to secure the 'Vice Champion' position of the 2016 Arenacross 65 Youth Class! Not bad for his first outing for Team Judd Racing and for the start of the 2016 season! This year is going to be very, very interesting for Team Judd Racing especially with the fast approaching upcoming Nationals - the Judd Racing MX Premier Cup and the Thor BYN's. The full team will be competing at both and we know the rest of the team are raring to get into the action. So watch this space! 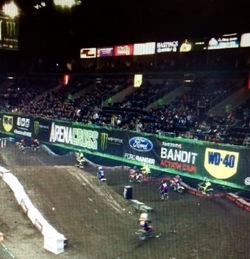 Ollie Closes Lead At Arenacross To Just 1 Point! Arenacross Sheffield - Round 10! Ollie Colmer with his Team bike! 13/02/16 - A mixed bag of results at Arenacross Sheffield this weekend saw Team Judd Racing 65 rider Ollie Colmer climb 5 points, to now sit just one point off of top spot! Although his card wasn't the normal 1st or 2nd finishes that he's previously racked up in this competition, a 5th and a 10th was enough on the day to maintain his Championship Position of 2nd, whilst narrowing the 6 point gap at the top of the table to a mere 'one' point! The final round at Wembley in a fortnights time is going to be a gripping 'winner takes all' affair, and we can't wait to see it! If you haven't got tickets yet then we strongly advise you to get them quick, because this is going to be one race not to be missed! Ritchie Wins Series, Clark takes Series Runner Up, and Colmer Wins Arenacross Round 9! Todd Ritchie flies to the 125 Title! 31/01/16 - What an unbelievable weekend of podiums for Team Judd Racing! We thought it was great last week, but this weekend surpassed it, as the Team Judd Racing riders really did the business! Todd Ritchie - WINS Pro Green Winter Series 125's! Todd set down his marker for the year with a win, taking the 2016 Pro Green Winter Series 125 Title! A second place on the day was enough to maintain his lead at the top of the leaderboard, at the final round at Mepal. It finished with Todd 14 points clear on 336, after the three round EASSC event. Ben Clark - 2nd Place overall at the Pro Green Winter Series 85SW's! At the same event it was Ben Clark who ran up an impressive 2,2,2 card at Round 3, that delivered both a 2nd on the day and the title of 2016 Pro Green Winter Series 85SW Runner Up! Ben finished just 12 points off the top spot. 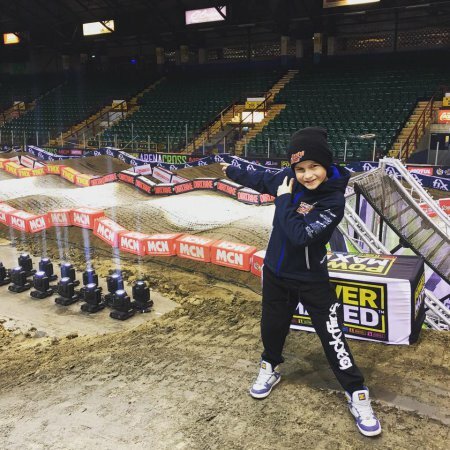 Ollie Colmer - WINS Arenacross Round 9 in Newcastle 65's! With a mixed Round 8 of a 1st & a 5th, Ollie moved on to Round 9 with pure intent in front of his home crowd of Newcastle and took two straight 1st's to win Round 9! After having led the Championship it now leaves him just 6 points adrift of top spot, but with only two rounds left to contest it's going to be a tight one! Roll on Sheffield in just under a fortnights time. Kalvin Kelly - WINS Pro Green Winter Series Auto's! A huge shout out also has to go to Judd Racing Supported Rider Kalvin Kelly! A hotly contested Auto's section saw Kalvin secure a Round 3 card of 1,4,1 to finish the Series on 348pts. That's just 2 points ahead of rival Shaun Mahoney, in one of the closest Auto competions we've seen. Kalvin won Round 3 and with it won the Series! 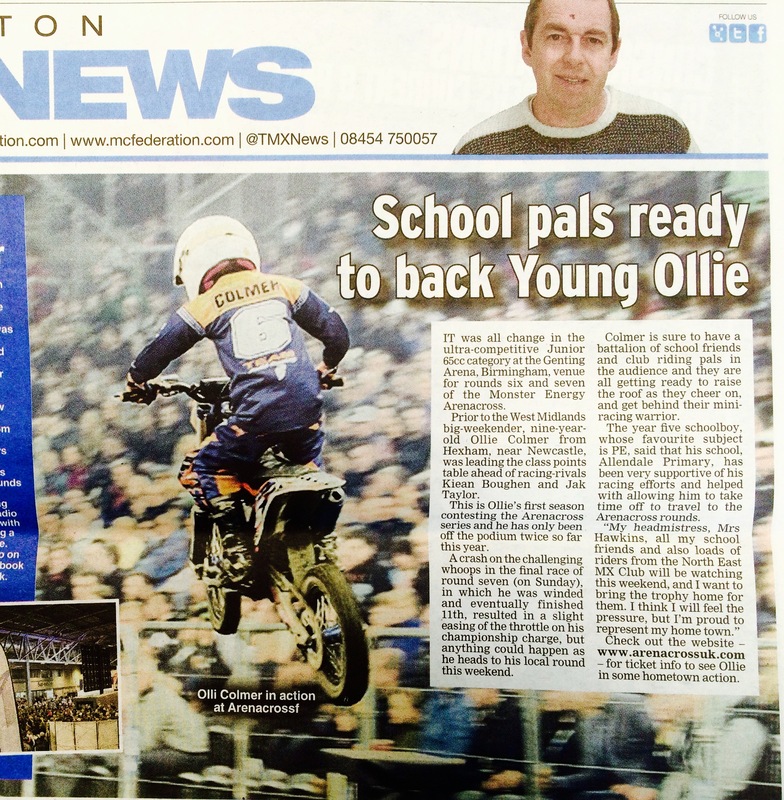 Great Coverage of Team Judd Racing Riders in TMX News! 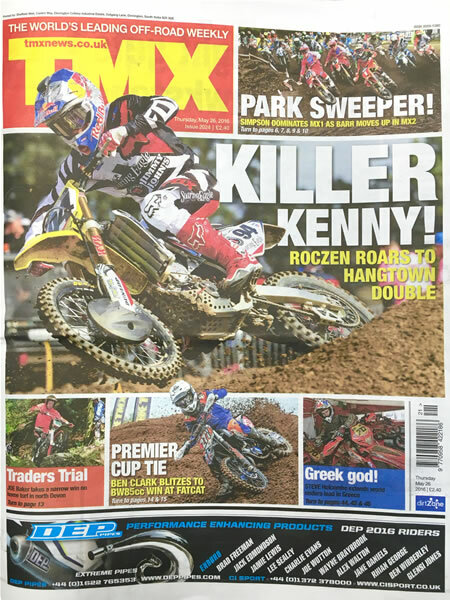 With some great riding and results it was no surprise that TMX News would cover the events of last weekend in this weeks issue! With mentions & inclusions of some of the Team Judd Racing riders (Ben Clark, Todd Ritchie, and Ollie Colmer) and supported rider (Kalvin Kelly), it makes for a good read, especially with Newcastle Arenacross and the final round of the EASSC Pro Green Winter Series virtually upon us! Click on the images ﻿left﻿ & below to see larger versions. 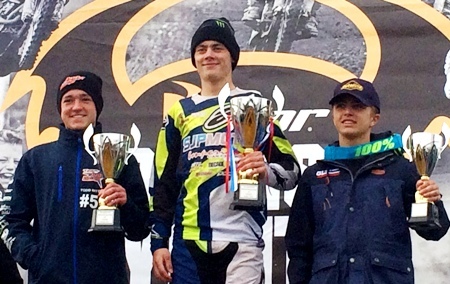 Team Judd Racing Riders Shine at Pro Green Winter Series! Leader of the pack - Ben Clark at Mepal! 24/01/16 - What a weekend for Team Judd Racing as both SW85 rider Ben Clark and 125 rider Todd Ritchie excelled at the EASSC Pro Green Winter Series at Mepal Motopark on Sunday! The three round series was at it's crucial half way phase in Cambridgeshire, ready for both riders to make an impact, and boy did they! Ben Clark on his newly EHR tuned SW85 flew and racked up an excellent 2,2,1 card to take 2nd place for the round, moving him up from 3rd to 2nd in the Series, just 12 points off top spot! In the 125's Todd Ritchie was the man to catch, winning the day with a 1,2,1 card and putting himself firmly on top of the pack in 1st place in the Series! Round 3 in just a weeks time takes place back at Mepal and should be a cracker! 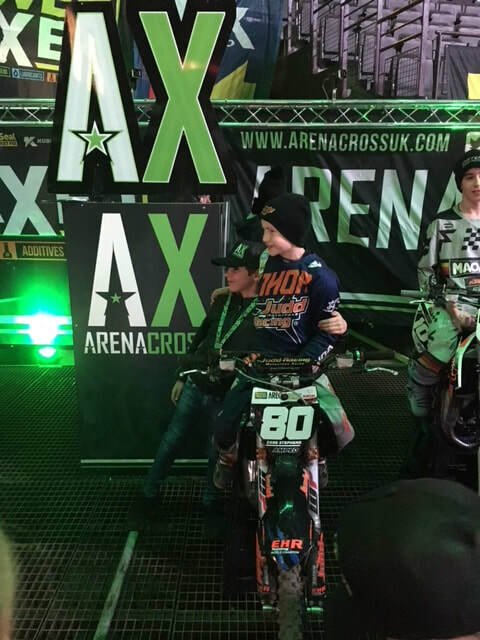 Over at Arenacross in Birmingham it was a return from injury for 65 rider Riley Keene, who although suffering a bad fall in Round 6 managed a well earned 5th place in the Finals of Round 7. Team mate Ollie Colmer in the meantime got a taste of the limelight when he was asked to join Pro Riders Cyrille Coulon - FRA, Thomas Ramette - FRA, Jack Brunell - UK, Fabien Izoird - FRA, and Florent Richier - FRA, for autograph signing, as part of the only pre show Pit Party of the 2016 Tour! What a unique honour! 125 Ace Todd Ritchie takes 1st in the Pro Green Winter Series! Riley Keene pre race at AX Birmingham Rd6! 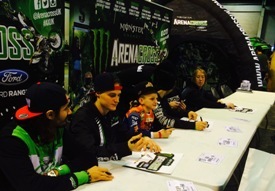 Ollie Colmer signing autographs with the Pro's at Birmingham Arenacross! Riley Keene returns from injury! With Round 6 of the Monster Energy Arenacross just around the corner, it's great news for Team Judd Racing, as Riley Keene is set to return to the Championship! The ankle injury that Riley sustained at the opening round in Manchester has meant a four round lay off for the 65 rider, but he's finally back and ready to turn up the heat at the Birmingham Genting Arena this Saturday. 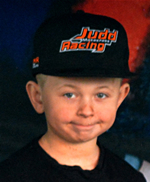 Good luck Riley and welcome back from all at Team Judd Racing! Ollie Consolidates Championship lead in Belfast! 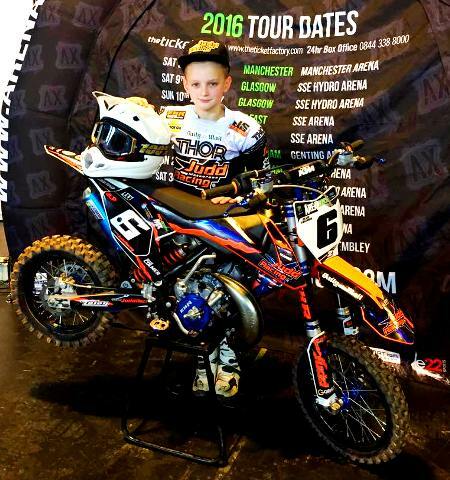 16/01/16 - It was a topsy turvy weekend for Team Judd Racing 65 ace Ollie Colmer, as Round 4 & 5 of Arenacross ripped through Belfast! There is a great video (see centre image below or click here) of this race. When watching keep a look out for Ollie in the white helmet, with orange and blue team kit. Day 2 and round 5 got underway with the Team Judd riders consistency shining through with a 1st again in Race 1! Unfortunately though a fall in Race 2 meant a 12th position for the final ride in Belfast, but the good news was no major injuries and Ollie came away from Belfast with his Championship lead stretched by 1 point to put him 14 points clear at the top! It'a a thumbs up as lead stretches to 14 Championship Points! Check out the video of Ollie coming from last to take 2nd place! Caught by the camera's! See Ollies interview with TMX here. 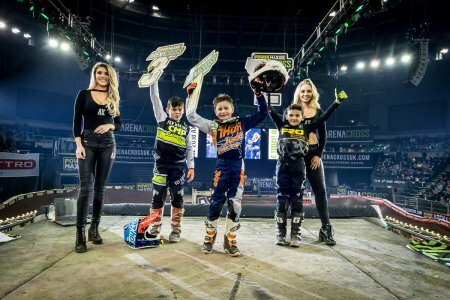 Team Judd Racing's Ollie Colmer wins Arenacross Glasgow! 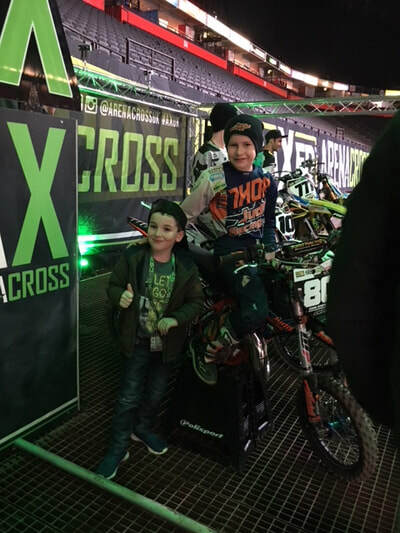 09/01/16 - It was a two day double header for Arenacross as the Monster Energy & Ford sponsored tour rolled into Glasgow for Round 2 & Round 3 at the SSE Hydro. 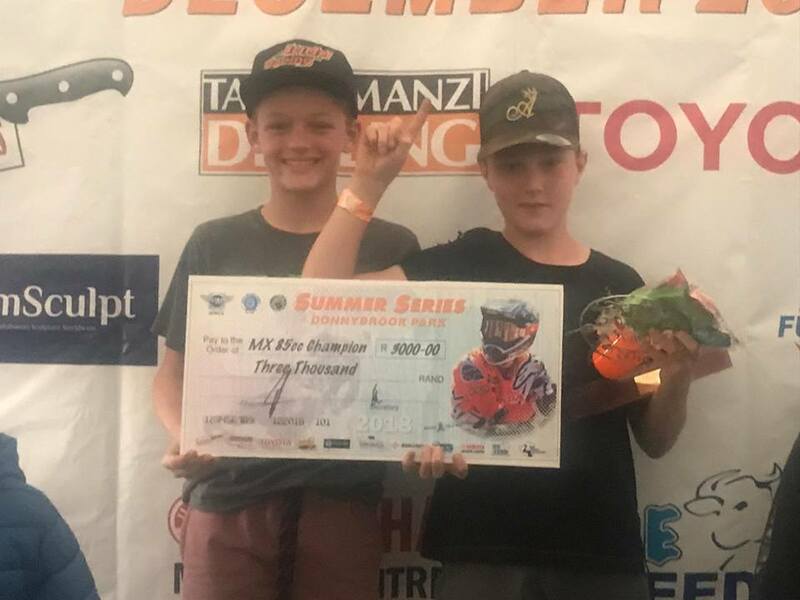 Team Judd Racing's Ollie Colmer mopped up in the 65's winning Round 2 on the Saturday with a 2nd then a 1st in the evenings Final to take the coveted podium (image shown left). He followed this with a points win for Round 3 on the Sunday with a consistent 1st & 2nd, to put him 13 points clear at the top of the 2016 Championship Table with 114 points! 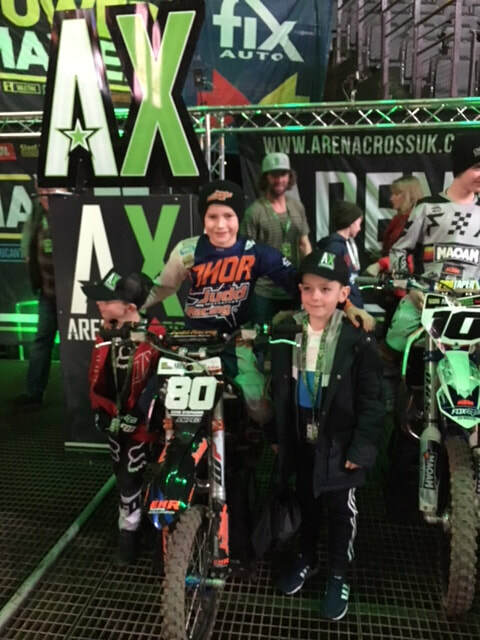 Team Judd Racing off to a flyer at Arenacross Manchester! 02/01/16 - What a start! 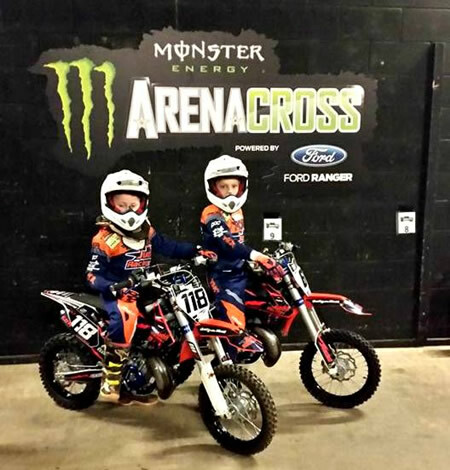 Team riders Ollie Colmer and Riley Keene set Team Judd Racing off to a great start at Round 1 of the Arena Cross National Championship at Manchester on Saturday! Ollie thumped home with the Teams first win and podium, winning Race 1 to take 1st, and following this up with a 2nd in Race 2. This puts him in 2nd place and level at the top on Championship points with 38, setting him up perfectly for Round 2 when Arena Cross heads to Glasgow. Riley unfortunately sustained an injury during qualifying which will put him out of Glasgow, but amazingly he still managed to ride in Race 2 even with the injury to take a gutsy and very respectful 9th place. The boys woke up Saturday morning and took a walk around the circuit with myself. They were very impressed with the track and couldn't wait to ride it. Ollie & Riley went out for free practice and just took some time to learn the track. In free practice the boys posted 6th and 7th fastest times but we were all aware they had a lot more to offer in the next sessions. After a team talk and a couple of changes on the bikes they both set off for their qualifying time practice. Unfortunately during the qualifying time practice Riley Keene had a big crash whilst on a fast lap and suffered a damaged ankle. Meanwhile Ollie was flying the flag for Team Judd Racing and posted a 2nd fastest time. Riley was down to 6th. In between the qualifying and the non public race Riley received some treatment to his ankle from the medics. Unfortunately Riley was still in a lot of pain but decided he didn't want to let the team or himself down, so decided to race regardless! With Ollie only getting faster as the day went on, he knew where he wanted to be as they all lined up for the non public race. Ollie got off to a flying start and was leading where he stayed for most of race, before finally finishing on the top step to take the first win for the Judd RacingTeam. Meanwhile Riley battled on with a damaged ankle to take 8th. We all knew he was capable of a lot more but were happy he'd raced. After the non public race we had a long break where the boys and team members had some food and rested ready for the night race. The time was finally here the night show started, Riley and Ollie where both pumped! The boys lined up with 1st and 9th gate pick. Again Ollie got off to a flying start and was out front early. Ollie and Kiean Boughen swapped places several times. The crowd was on their toes as it came down to the last corner but unfortunately Ollie finished second. Meanwhile Riley was riding a safe smart race due to his injury and was to finish in a respectable 9th place. As a team we are very happy with how the first outing went and are looking forward to the next round in Glasgow. Unfortunately Riley will not be competing in Glasgow due to the injury sustained to his ankle. 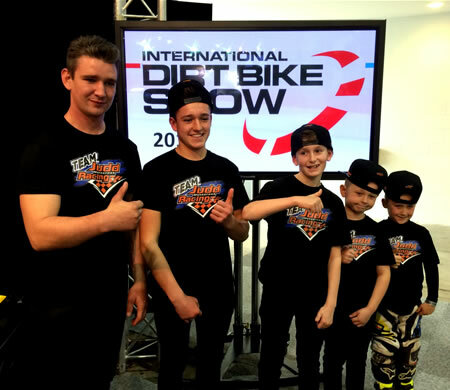 Team Judd Racing launches at The International Dirt Bike Show! 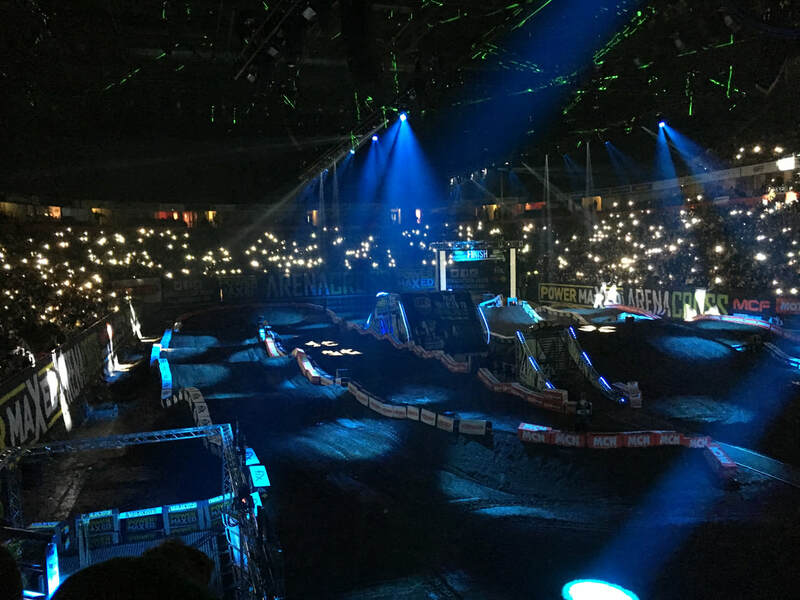 01/11/15 - Stoneleigh Park, Coventry was the location and the place was the main stage at the International Dirt Bike Show 2015, where Team Judd Racing were launched and interviewed live by the 'voice of motorcycle commentary' and IDBS's very own Jack Burnicle! The team took to the stage on the exhibitions final day where they were individually grilled, very eliquently by Jack. Team Manager Jamie Smith also laid out his asperations for the Team in the coming year, stressing there was nothing wrong (when questioned) with having a professional attitude and outlook in motocross, regardless of age. Something that is fundamental in the core of Team Judd Racing. Missing from the presentation was 65 rider Ollie Colmer who is the 5th member of the Team. Back stage, waiting to be announced! SW85 rider Ben Clark takes centre stage! Jack Burnicle speaking to smallest Team member Spike Stevens!